France is being over run. The BEF has escaped,but just barely, having to leave half of it's heavy equipment and support vehicles in France when it was pulled out. The French army tried to make a stand outside Paris just like twenty years earlier but were outflanked and pushed out of the way by German armor. 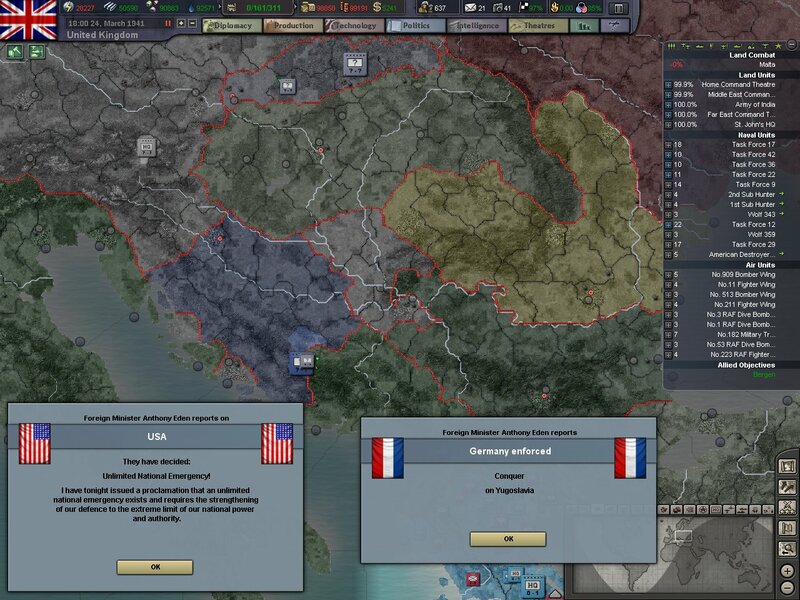 With the final French stand broken it was now only a mere matter of time before France would fall. In the invasion of France, German armored units and divisions displayed tremendous confidence and tactical knowledge with their assaults and operations. Time and time again the French tried to set up a frontline only to be outflanked or shattered by the German armored spearhead. 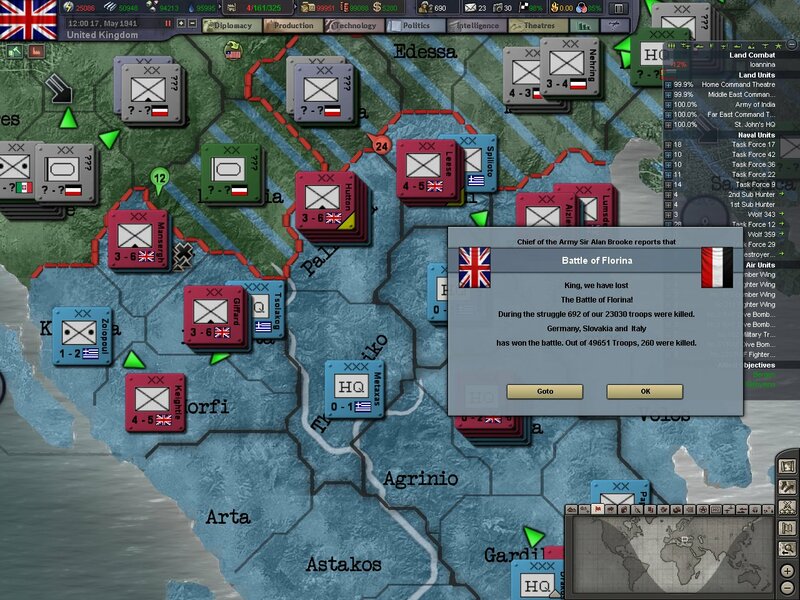 The few times the BEF had engaged German troops, our brave Empire boys had managed to hold the Germans off. But the Germans would simply pull up their heavy armor and either shatter our lines or outflank us. With France now all but gone, our attention would have to shift to the Home front and the few places our troops are engaged. The two carriers that were ordered in 1938 are nearing completion. The Ark Royal and Illustrious will become the new flagships of the Royal Navy and be at the center of our fleet. In July 1940 an order went out for a special breed of soldier. The type of man who wasn't afraid to go into the dark night and not care if he might be coming back. Soldiers from all over the Empire answered the call and by late 1940 a corp of Royal Commandos was nearing completion. Our main focus in research is on land technology with an emphasis on movement and light infantry. 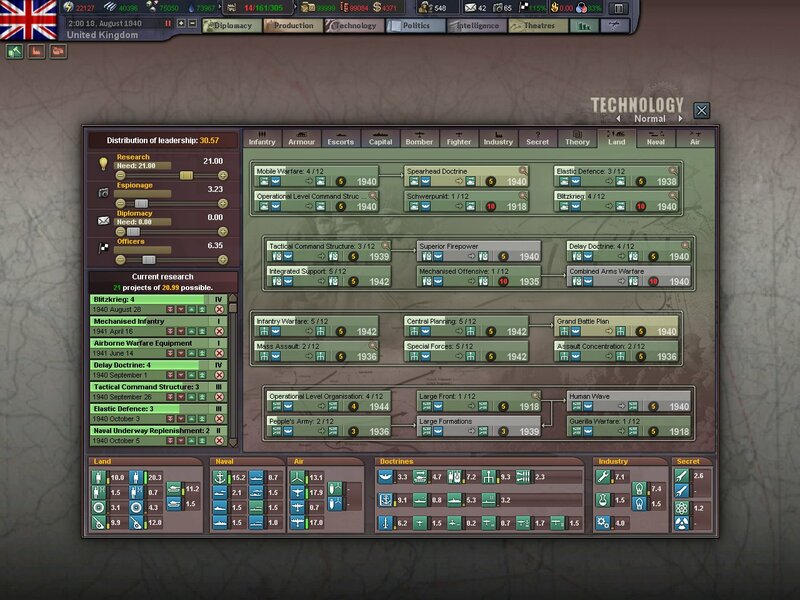 We would also be giving care to keeping our main techs (infantry, fighter planes and artillery/AT) up to date. Radar, nuclear and rocket research is also being given priority. MI6 has managed to infiltrate every aspect of the Nazi war machine, as well as the Italians, and the Japanese in the Far East. Knowing what our enemies are constructing and preparing will give us a keen advantage that we will have to use if we are to win the war. 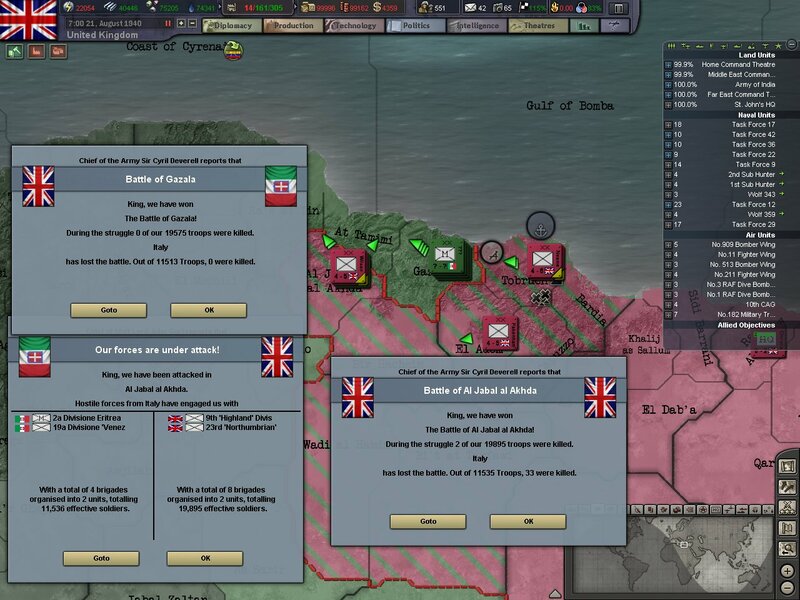 In eastern Libya our ground troops made strong progress; and began to outrun and surround the few Italian troops that had been on the frontier. Movement and ease of supplies will be the key in North Africa. 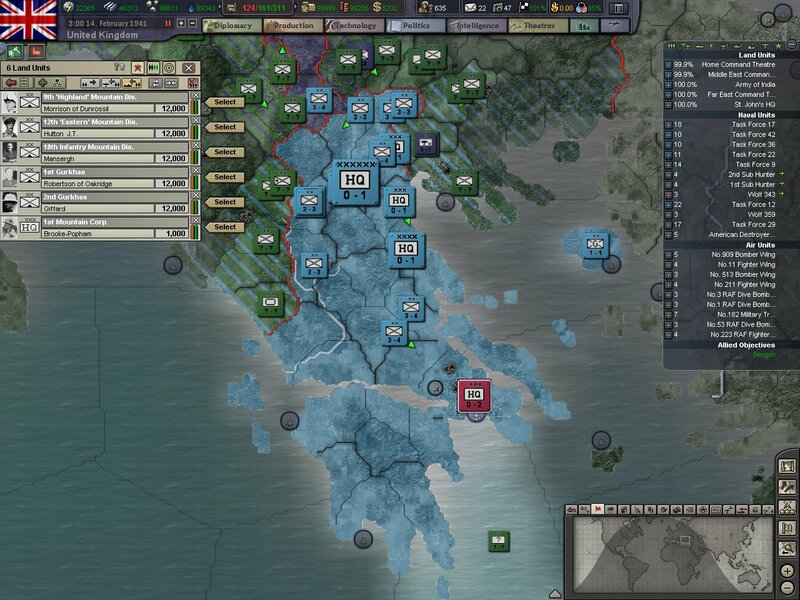 To keep our men moving and fighting we have to take all the ports we can and keep the naval supply lanes open. 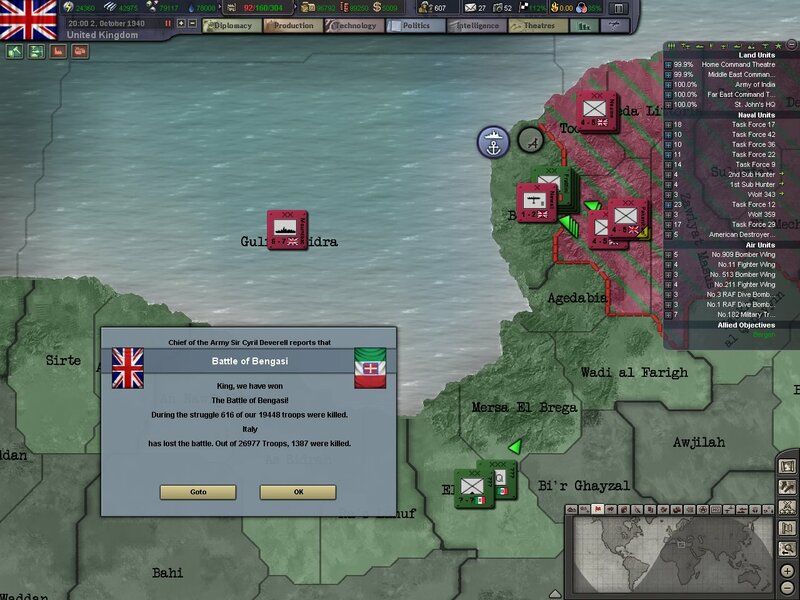 In Ethiopia our cavalry corp made swift progress and inflicted substantial losses on the scattered Italian defenders. The few Fascist troops that are posted in this far flung Italian outpost do not have the support or organisation to fend off our mounted attacks. 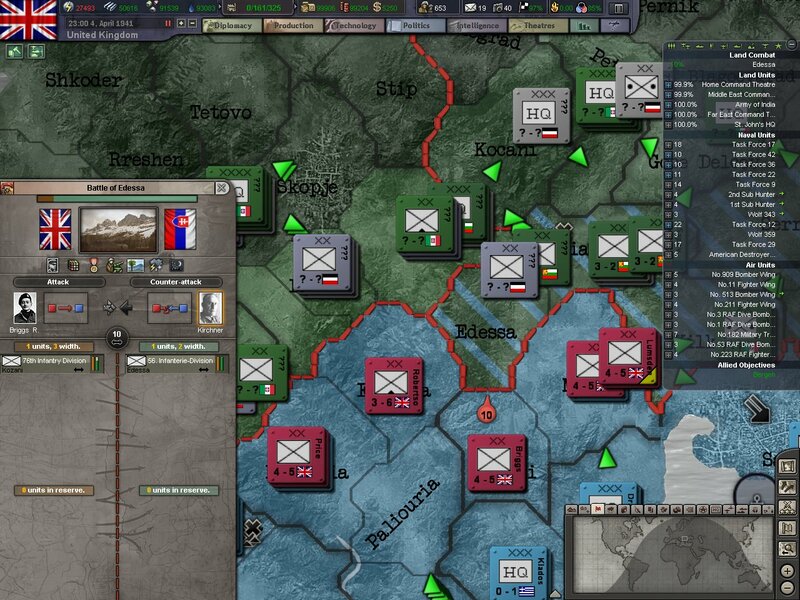 Two weeks after our troops stormed Tobruch, we managed to out maneuver and surround the eleven thousand Italians. 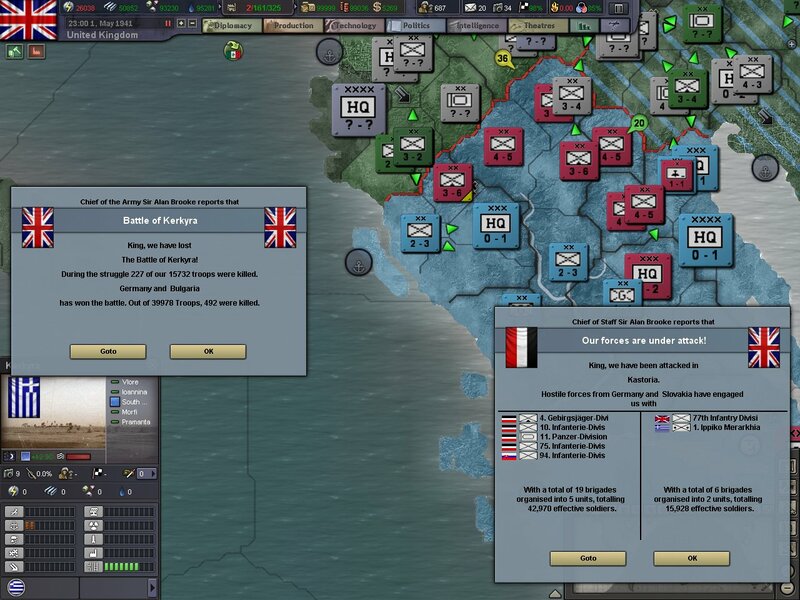 The enemy troops chose to surrender on the 25th. Leaving the path to Benghazi open for our brave boys. When the war against Italy began, a pack of submarines were ordered in the Mediterranean to hunt and destroy Italian supplies to Libya and Ethiopia. Wolf 359, while searching south of Malta, came across a strong Italian surface fleet and engaged them. In the ensuing battle, one submarine would be lost with an unknown amount of damage done to the Italians. This engagement alerted our forces in the Mediterranean that the Italians were not afraid to sortie out and attack our convoys or ports. Almost a year to the day the war began. France has surrendered. 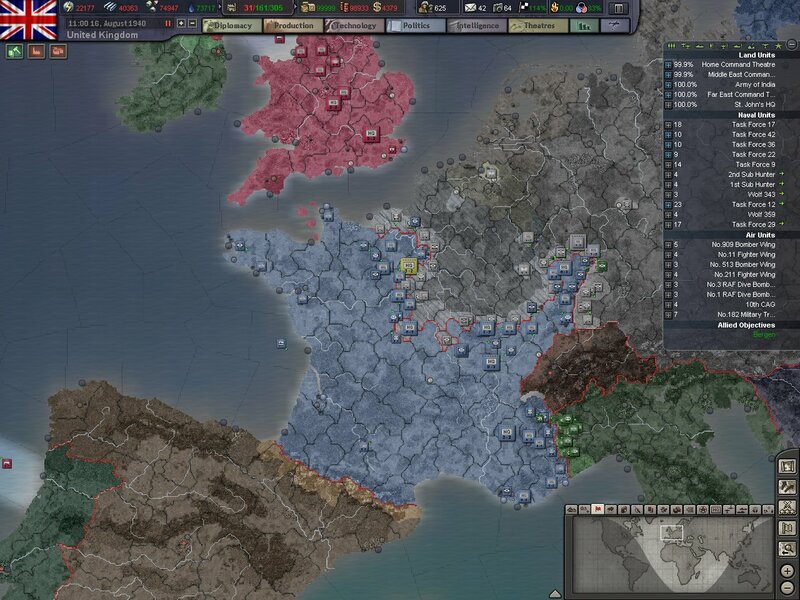 With Paris occupied and it's armies shattered. France has capitulated. 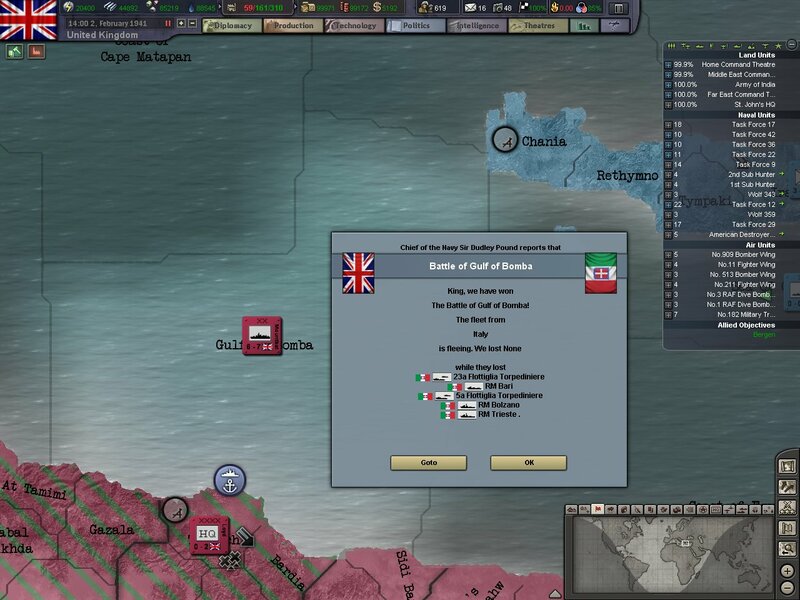 A puppet government will form in the south of France and will oversee it's colonial holdings. However our strongest and most important ally, is now gone. 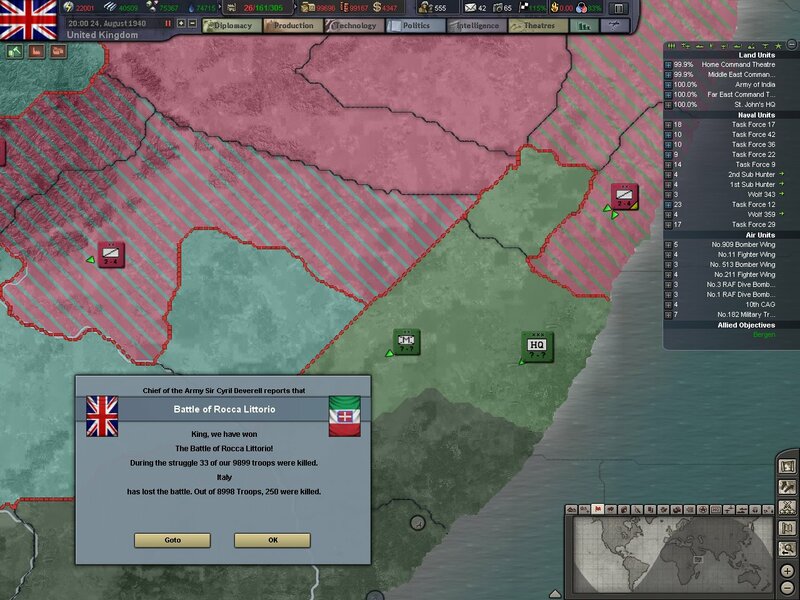 Good news ultimately arrives - Ethiopia has surrendered to our brave horsemen. 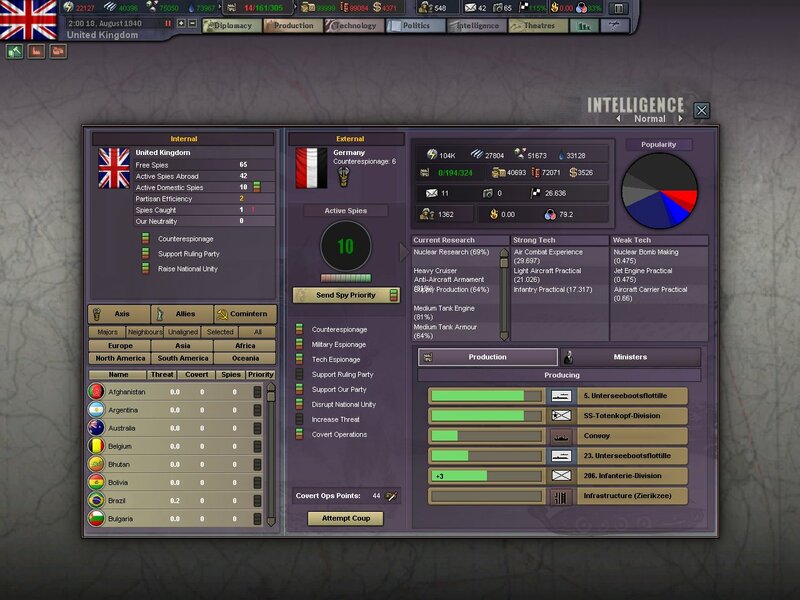 The small country has been quickly added to our Empire and engineers have been sent immediately into the country to begin to help modernize the colony and bring it into the modern world. Many members in our government see the fall of France as the end. Debates in parliament begin to hold dangerous notions of surrender. Many men are saying that we should begin negotiations with Nazi Germany for a peace. And that we simply cannot stand up to the might of the Third Reich. 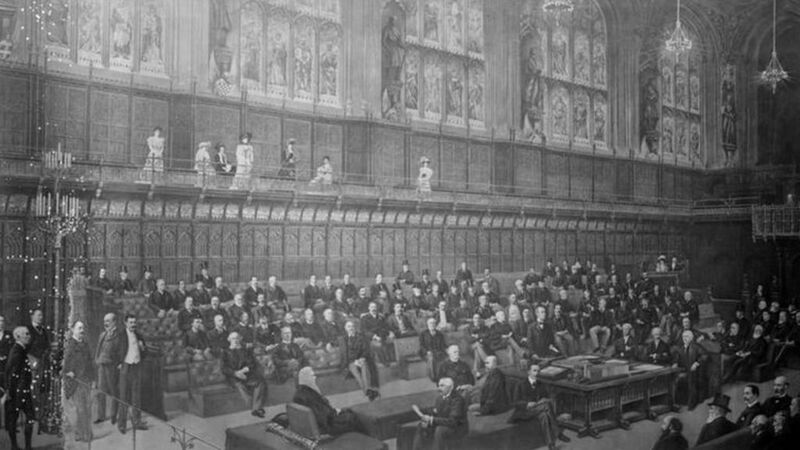 Members of the conservative party began to abandon their own and cross the aisle and argue against their party. This internal strife would throw the Empire government into chaos, and it would only survive if a unified government can be made. As Parliament is thrown into chaos and strife, our American brothers show solidarity with us. 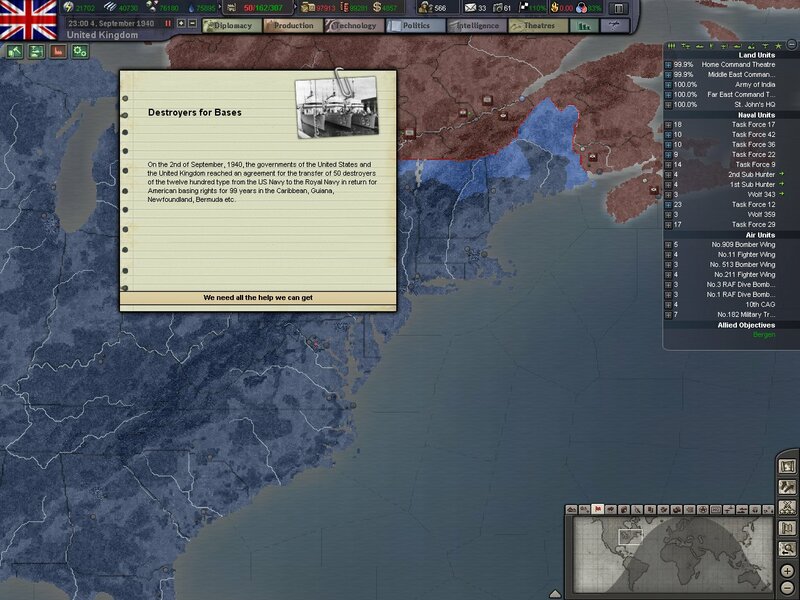 In exchange for letting the American Navy use our bases in Bermuda, the Caribbean, Newfoundland, and Guiana, the Americans have given us several destroyers to use at our discretion. These ships are immediately put into service hunting u-boats in the North Atlantic. When France formally surrendered, the majority of France's military arms were turned over to Germany. That included tanks, light and heavy artillery, and many hundreds of tons of fuel and supplies. The French fleet, however, had not been turned over yet. 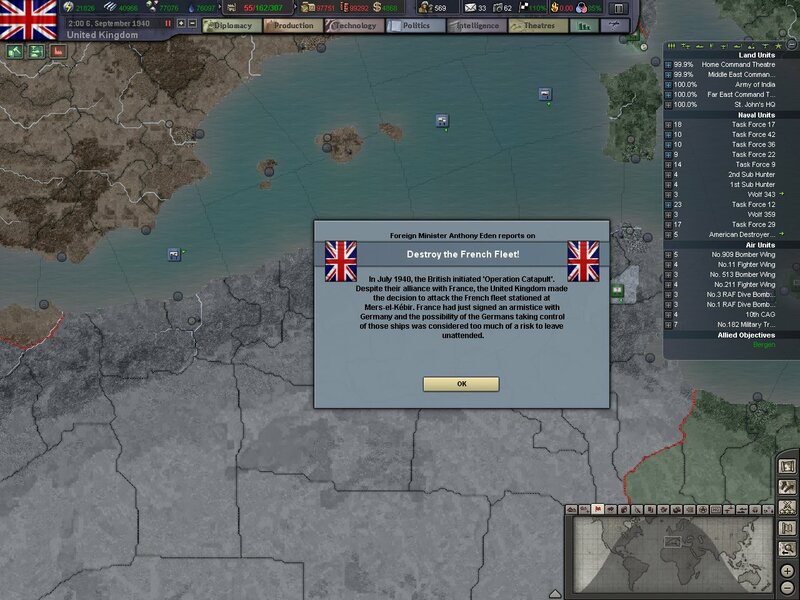 Several fleets had escaped to French Algeria and Morocco where they were taken in under the new French government, Vichy France. The prospect of Vichy France turning over the modern and extremely powerful French navy (which included aircraft carriers and several prime capital ships) was too much of a threat. A naval attack is ordered on the French fleet anchored at Mers-el-Kebir and is carried out by a combined battleship and aircraft carrier task force. The resulting battle is a turkey shoot. The French fleet is crippled and will spend the rest of the war in dry dock or at the bottom of the Mediterranean. As soon as word of the attack got out newspapers and politicians alike will denounce it as an attack on an ally and a breaking of neutrality laws. More fire be added to the chaos at home. In Libya, our African Corp made good progress as it advances towards Benghazi. Securing the port intact and with minimal losses will be crucial to future operations on the coast. 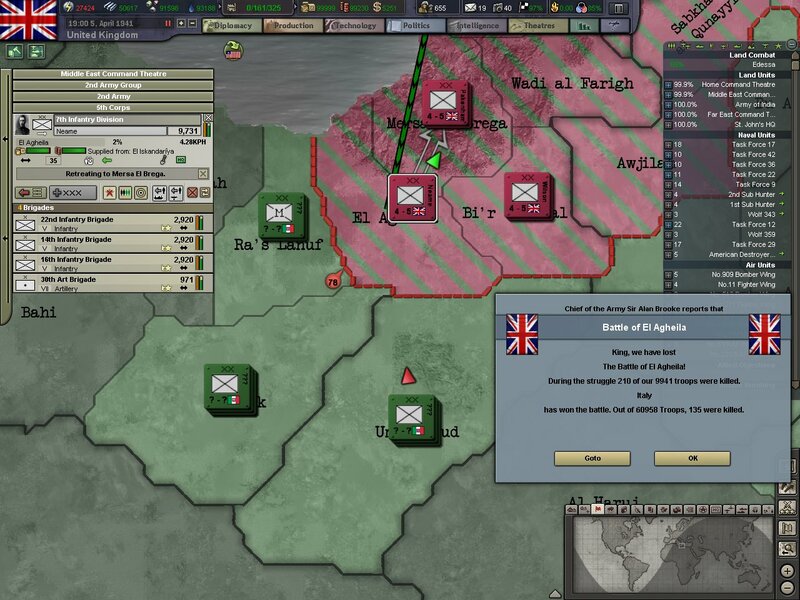 Having a port right on our front line will make supply transportation much easier on the Royal Logistics Corp.
Two days after our victories on the outskirts of Benghazi the crisis in Parliament has exploded. For the last two days, speeches rang back and forth across the aisle in the House of Lords and Parliament. 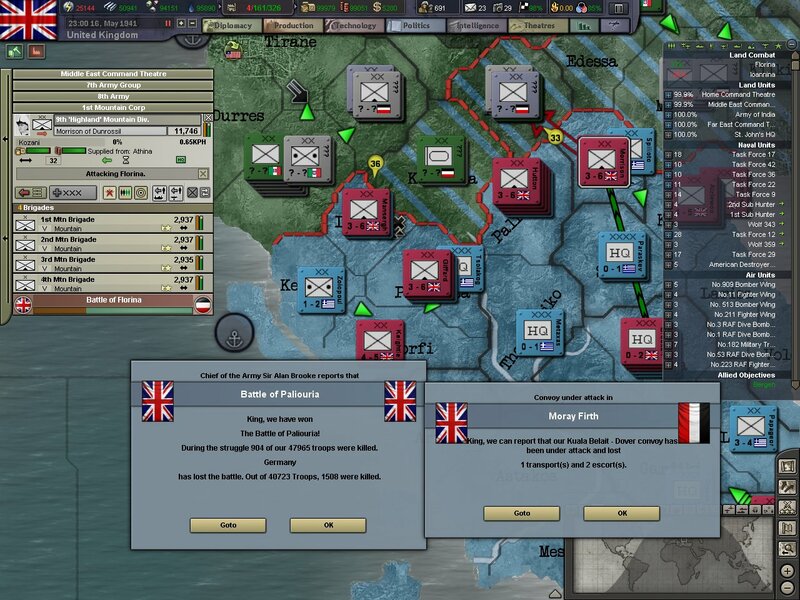 Chamberlain came under for letting France fall into the grasp of Hitler so easily. It is beginning to appear as if a no-confidence vote is going to take place and there is a possibility that elections may follow. 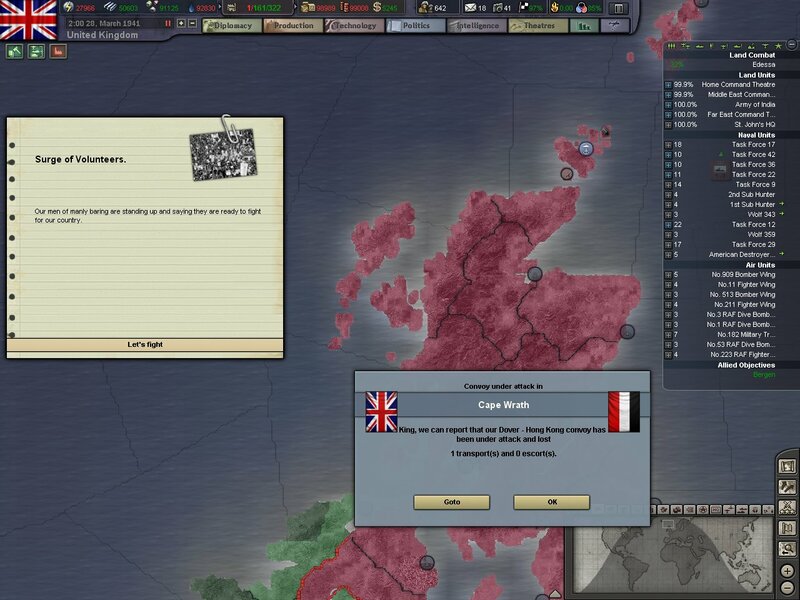 His Majesty, King George VI, stepped in. He knows that the country cannot bear an election, with the possibility of a German invasion and with Nazi bombers beginning to rain fire down onto London. 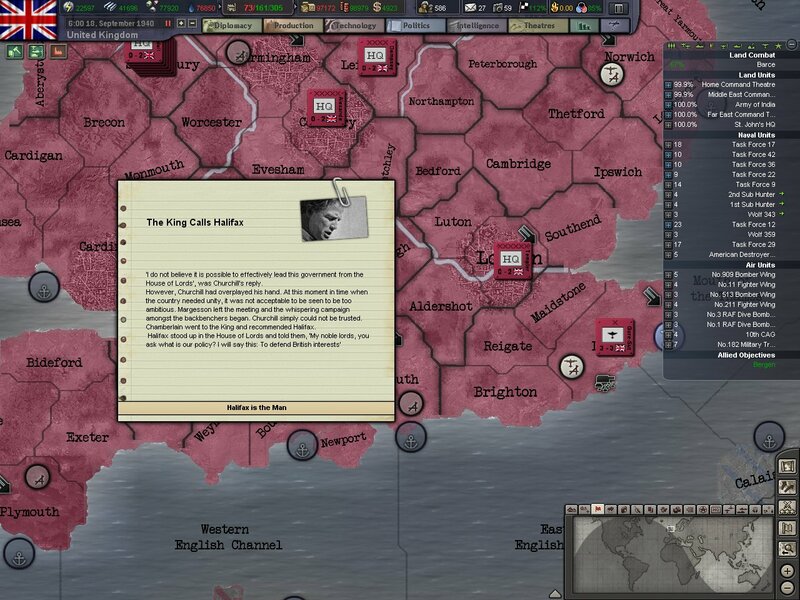 The King will step in and remove Chamberlain from power and will appoint Lord Halifax as the new Prime Minister. Lord Halifax and the King share an acquaintance , and with the appointment of Halifax as Prime Minister the King is hoping that he can keep a better grasp on his Empire's political situation would not spiral so far out of control again. 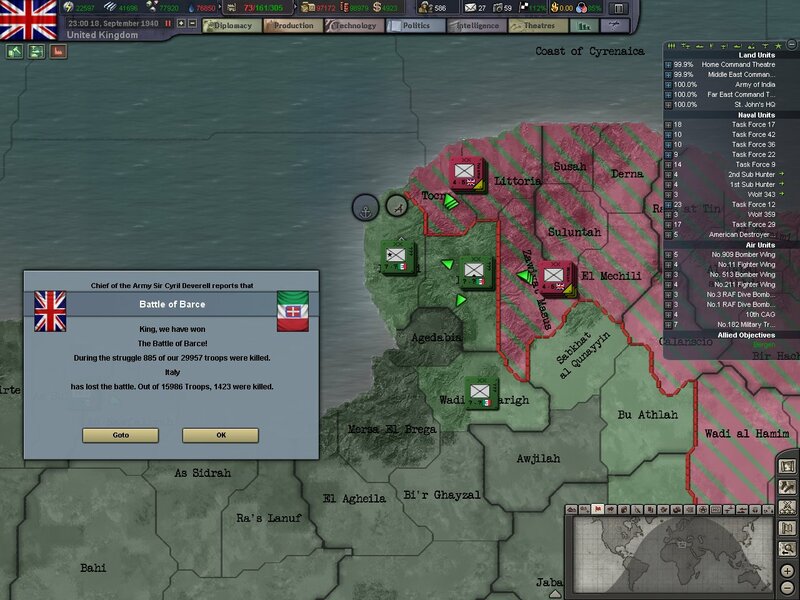 In North Africa, further gains are made and our troops keep advancing towards Benghazi. The death toll continue to rise however. The assault on Benghazi itself will follow this brutal battle. 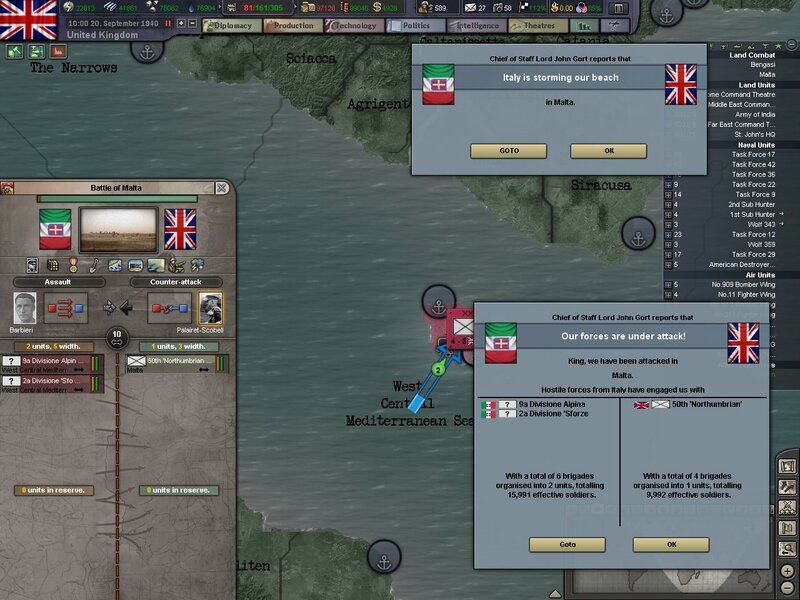 Italy finally took offensive action in the Mediterranean. The Italian navy launched an assault on the island fortress of Malta. The Royal Navy was placed on stand by in case the landings made any significant progress. 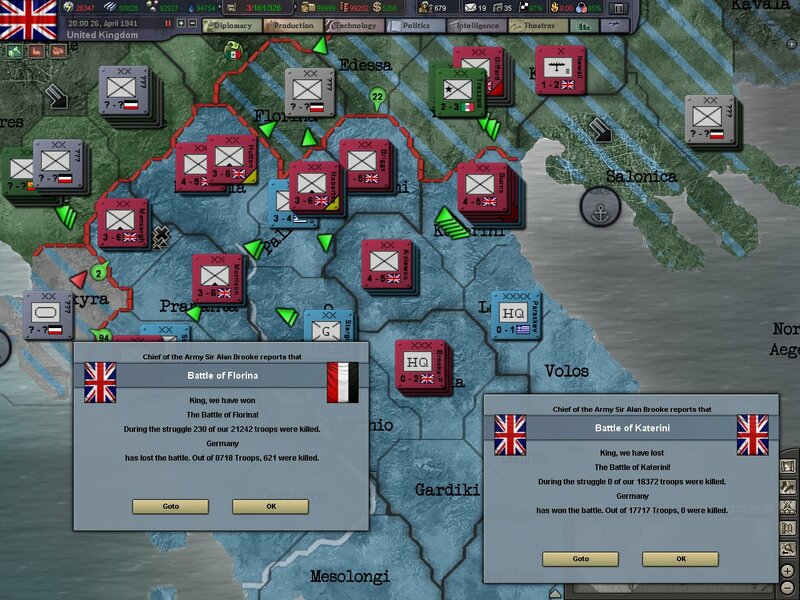 But by the end of the four day attack the Italians had not secured any beach heads and lost 1500 men to a grand total of 48 brave Empire boys dead. 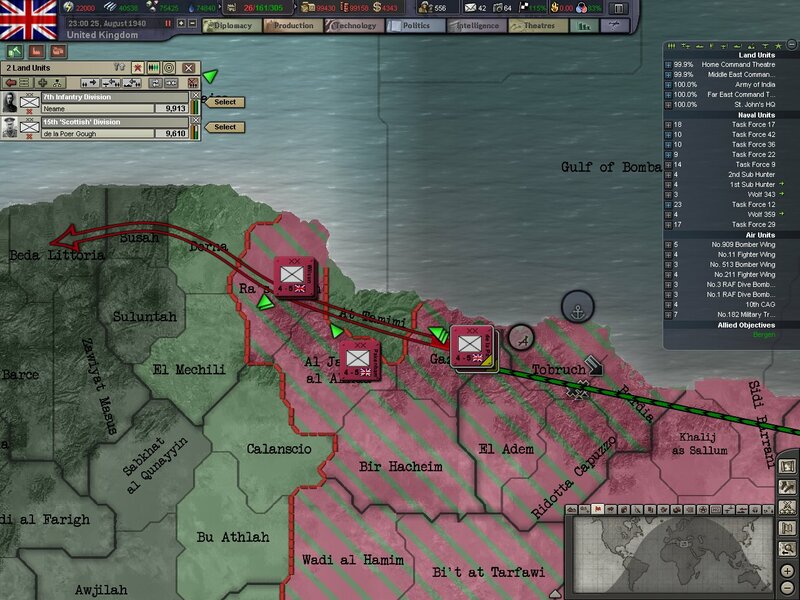 Our troops outside Benghazi are met with heavier resistance than was first expected,despite the intervention of naval support from our battleship task force and bombings based in Tobruch. Our troops are not able to take the city and are thrown back with considerable casualties. For once, our Empire got good news in September. The brand new carriers Ark Royal and Illustrious are launched September 27th and are made part of Task Force 22. They have yet to see action,however, the crews are eager to prove themselves. On October 2nd the port city of Benghazi finally fell. In total it cost our Empire nearly two thousand brave men and boys, but it cost the Italians 2,500 men and the loss of twelve naval ships lost in engagements outside the city. With our troops having fought several brutal battles to get this far, a halt to the advance is called to bring in replacements and fresh supplies. The advance from Egypt has been a brutal one and a rest is needed for our soldiers. 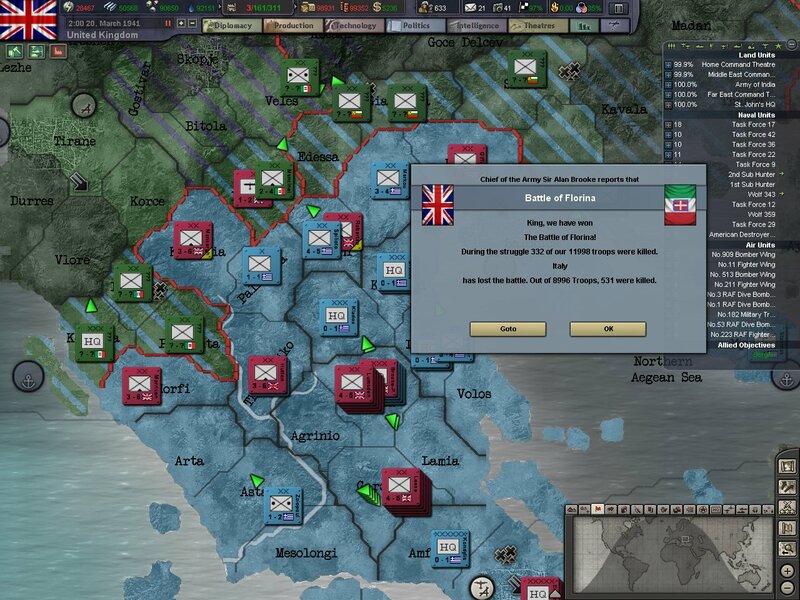 The respite will give the Italians a chance to regroup but our troops need it just as much as theirs. With a halt to the advance in Libya, our industry takes focus again. 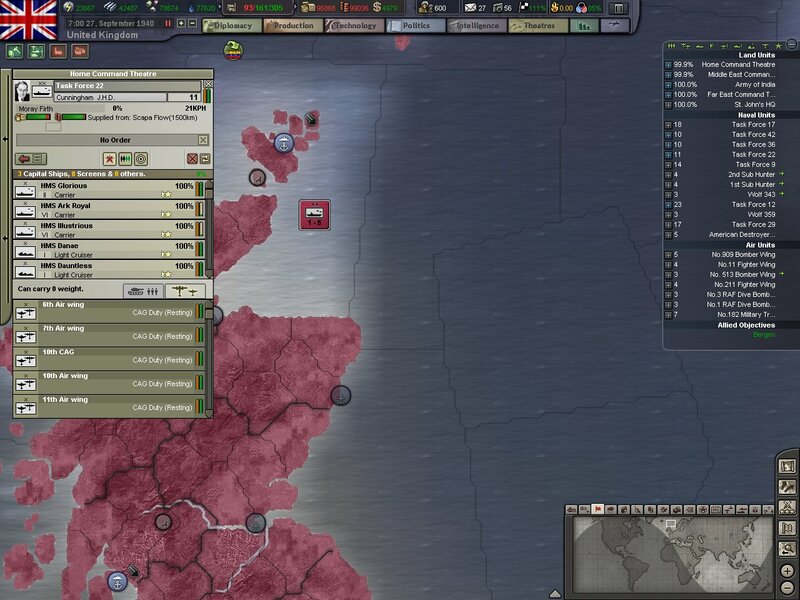 More ground attack aircraft are ordered as well as additional infantry corps. The most important project currently, is the construction of a top secret rocket test site high in the mountains of Scotland. This test site will hopefully allow us to keep pace with whatever the Germans plan on doing with their own. Two brand new infantry corps finished training in late October. These troops will join our airborne corp, our Royal Marine Commando corp that finished training last month, and our already completed corps. These two new corps will most likely be deployed to the Far East to help shore up defenses around Singapore. 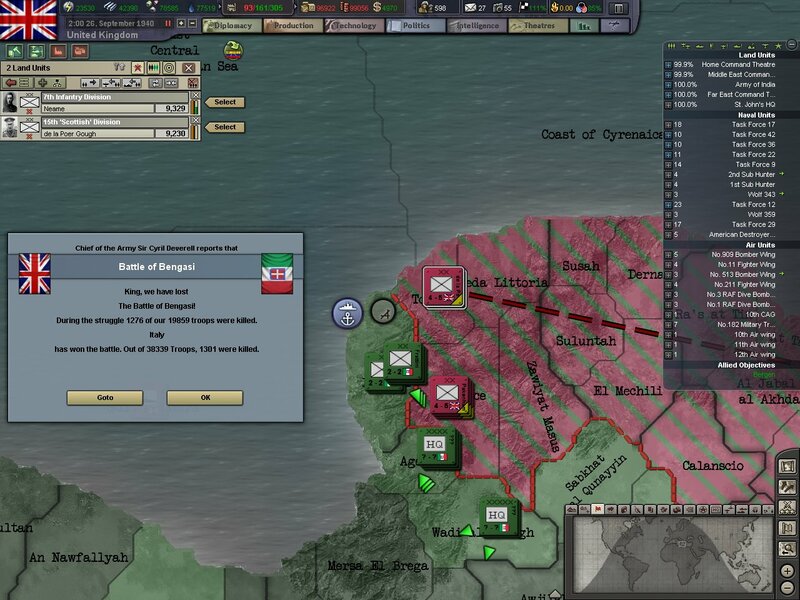 With a month of rest for our troops, an assault was launched on the Italian lines. At first our troops met with little success. With the support from our own navy off the coast and land bombers from Benghazi, we were able to turn to the tide. On October 30th and 31st we beat the Italians back, losing 900 men combined in the two assaults. 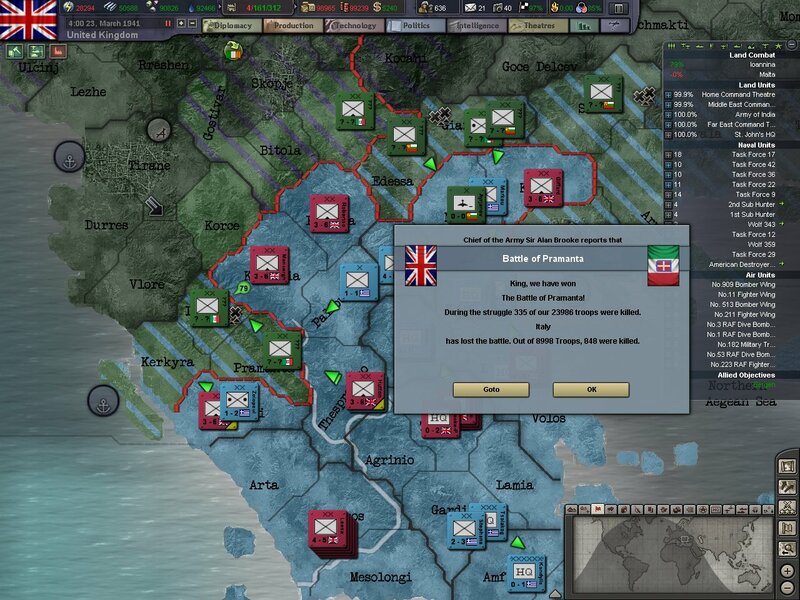 The Italians lose an estimated 1400. 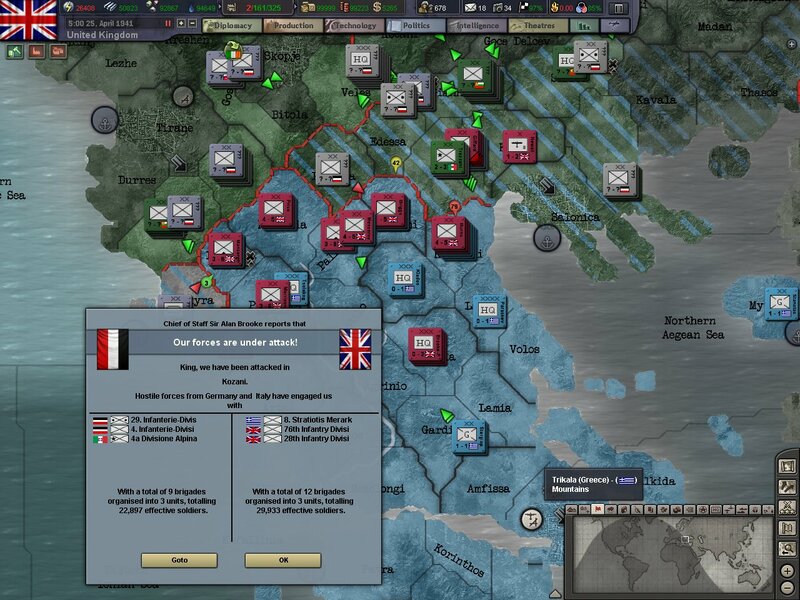 Two days later Mountbatten's naval fleet encounters a large Italian fleet on a sortie. The following naval battle proved to be disastrous for the Italians. They would lose one battleship, one light cruiser and three destroyers with only minor damage taken to Mountbatten's force. From the 10th to the 13th of November, our troops launched a series of bloody assaults on the Italian lines. 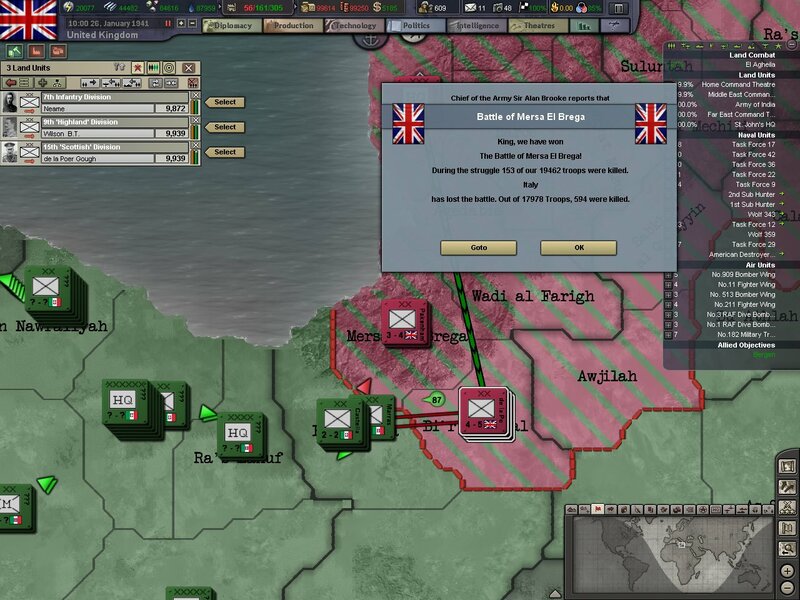 With support from Mountbatten's Task Force 29 and the carriers from Task Force 42, and bombers from Benghazi, we are finally able to break the enemy lines and drive them back. The Battle of Mersa el Bregal would be one of the bloodiest our troops had fought so far. Our troops would halt their advance here and hold in the old Italian positions. The enemy will try and drive us out but will be thrown back. One of the primary times this happens is on Christmas day when the Italians try to surprise our men. They lost 650 men in the frontal assault, our own losses were a mere 160 men. 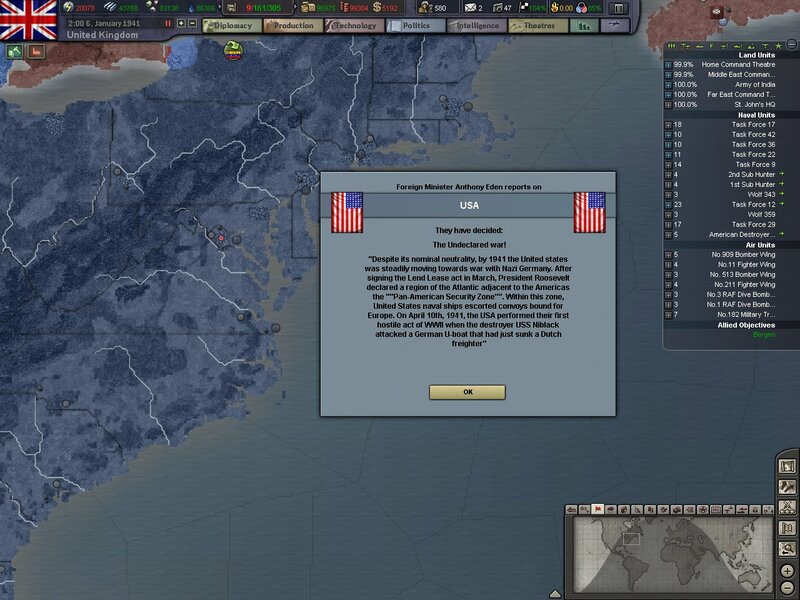 In the new year of 1941 the United States took several steps closer to joining the war. All these steps make American entry into the war a mere matter of time. With a lull in fighting around the world, we took the opportunity to organize our home forces. We formed the first and seventh armies, totaling in half a million men stationed in England. Many of these men will see deployment at the first possible action overseas, either defending our Empire abroad or defending nations from Nazi tyranny. On January 26th, the Italians launch two attacks on our line. 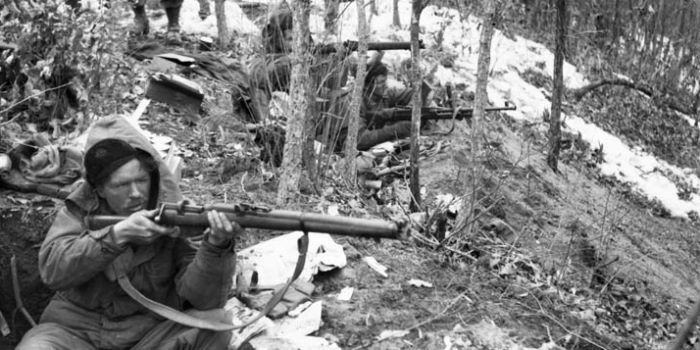 Both were repelled by strong counter attacks, maneuvering, and cost the Italians 2,300 men. February 1st. The Italians launched a surprise attack into Greece. Initially the Greeks held off the Italians. But Italian armor sped down the coast and threatened to cut off the main Greek defensive line. 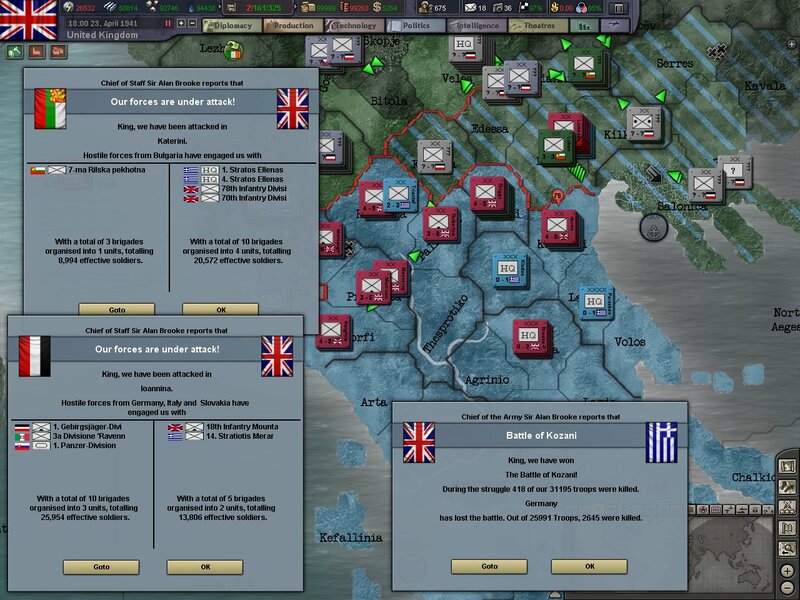 The Greek government formally requested support the following week and a small expeditionary force is made up from the troops in England. In preparation for our troops fighting in Greece, we would have to keep the sea lanes open. 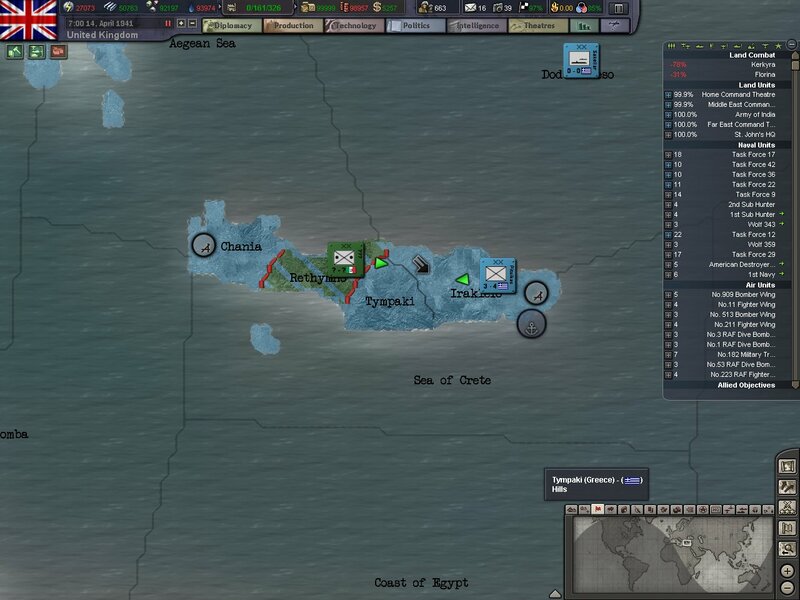 Our two task forces in Alexandria both began sortieing into the eastern Mediterranean in hopes of finding enemy ships. They did. 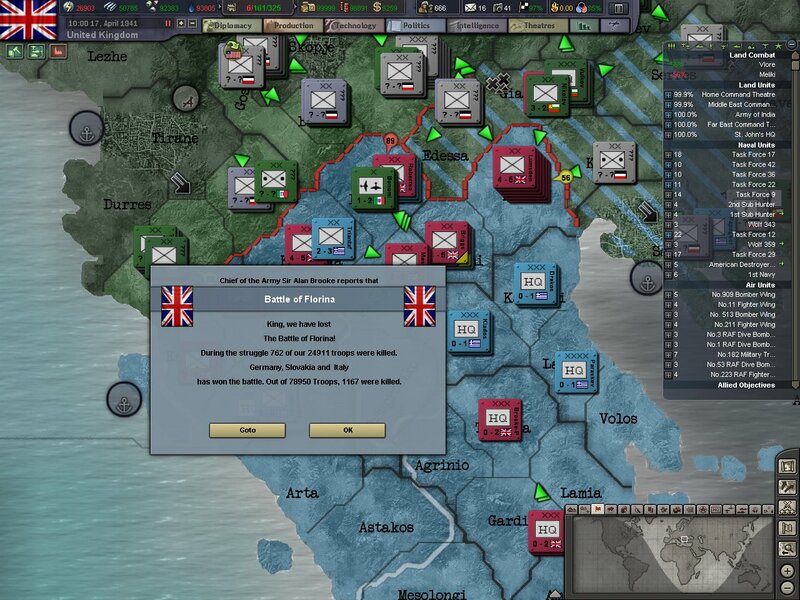 Another decisive engagement took place mid day on the 2nd of February costing the Italians more men and ships. On Valentine's Day the 1st Mountain Corp arrived in Greece. 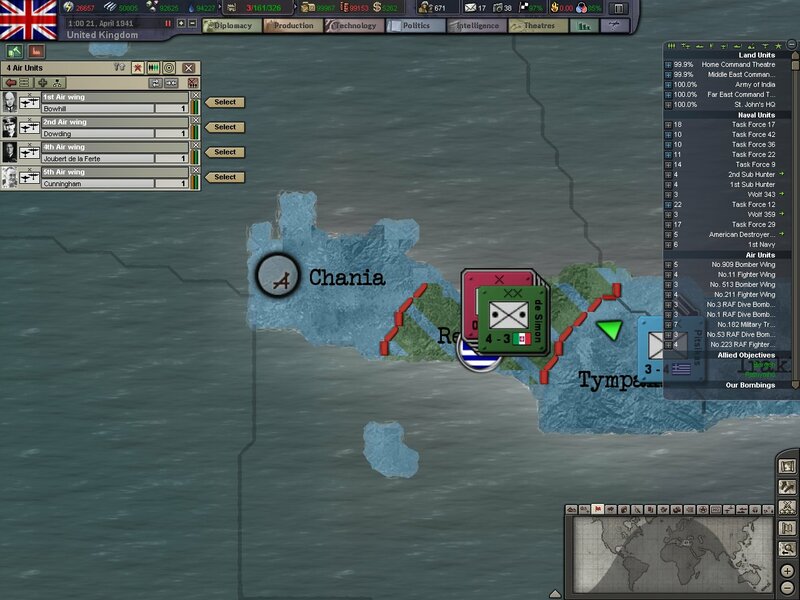 The first thing our troops did is stabilize the Greek line. 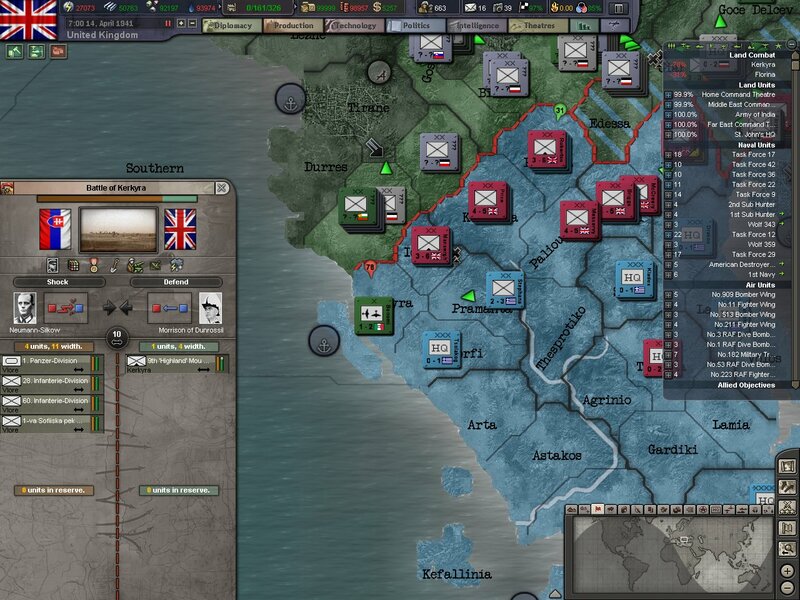 The mountains of central Greece heavily favor the defenders in any engagement. 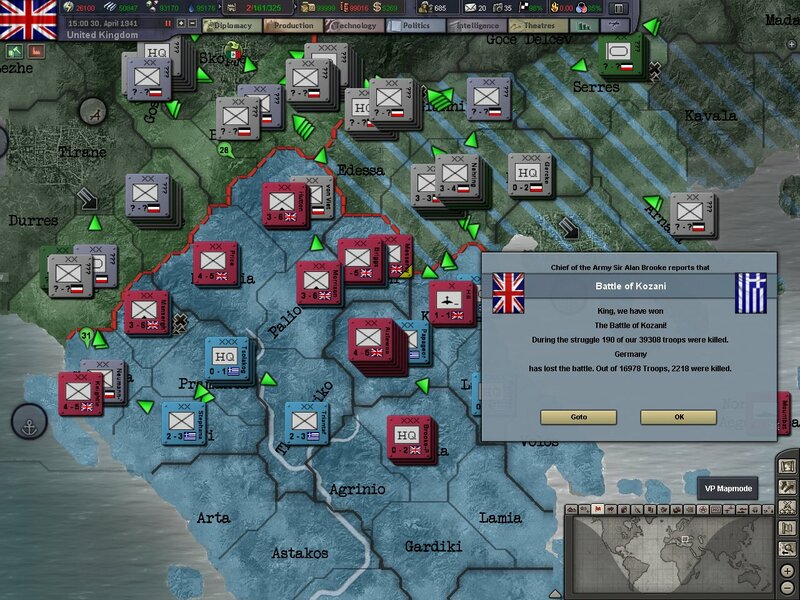 Artillery and air support are going to be crucial in our fight to retake Greece. In the coastal regions, our navy provided support and bombers that were in Egypt and Libya will be transferred to our new front in Greece. On February 26th our troops make first contact in Greece. 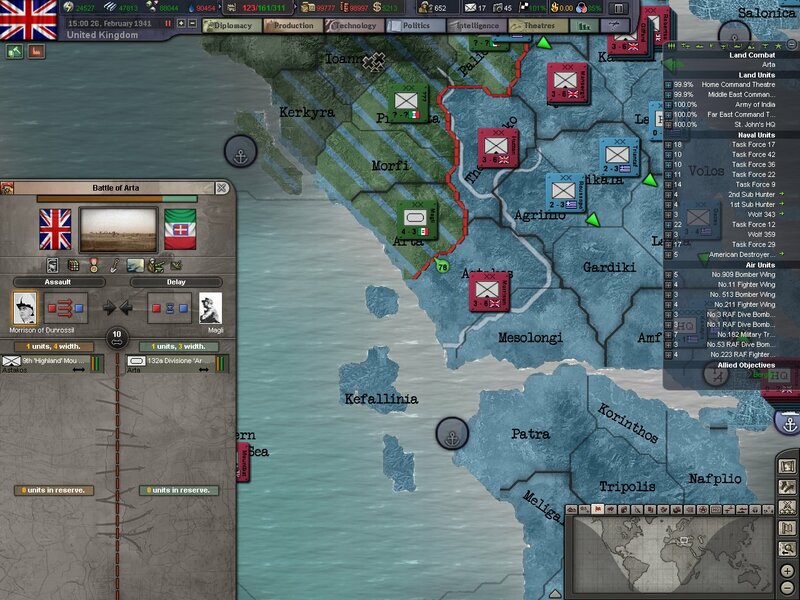 We launch our first attack along the coast in the path of the 132a Italian Armored. Our experience fighting in Egypt and Libya against the Italians gave us valuable insight when fighting the Italians in Greece along the Greeks. The 132a Armored was made up of young and inexperienced recruits. They had spent the first weeks of the invasion of Greece fighting the scattered Greek defenders in the mountains. But when they ran into British troops the experience was much different than fighting Greeks. More to the north we make quick progress against the Italians. Our few bombers and fighters are proving more than enough to control the air over the front lines. Several days later we wrapped up a bloody battle in Arta. The battle had been rough and bloody. The Italian light armor dug itself into the sides of the mountains, and we needed direct naval gunfire to dislodge them from their positions. Once we blew them from their mountain homes our advance was much easier. In the middle of March we would reinforce our position in Greece with two infantry corps from England. The Eighth Army is formed around the three corps in Greece under General Thorne. 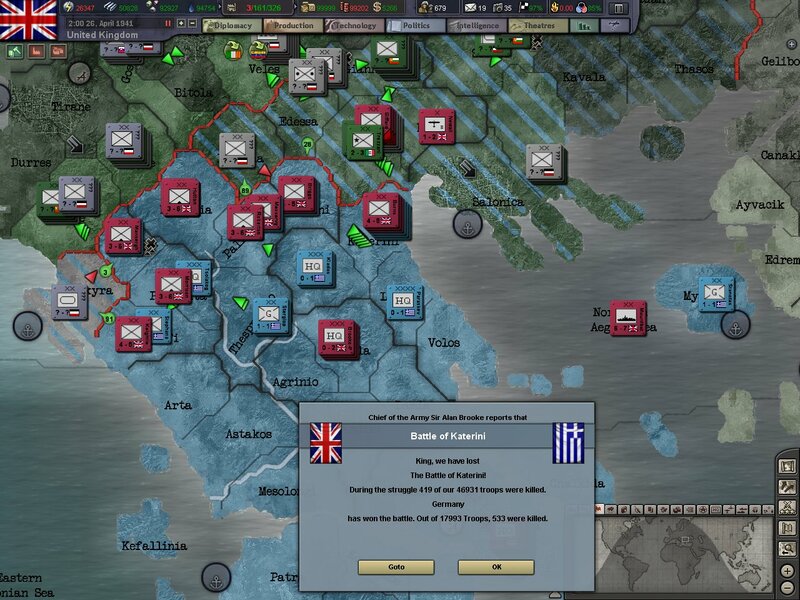 With most of Greece liberated, and our troops in well dug in positions in the mountain range the situation looks good. Finally, after many months of mass producing infantry battalions and divisions, we have now begun construction of a armored corp. These tanks would hopefully give our armed forces some extra bite in the coming fights. Another victory won in Greece. Our brave boys pushed the enemy out of Florina, suffering lightly compared to other victories in the country. Our air support was vital in the battle and our soldiers continue to expand the free parts of Greece. With Florina now captured, we can now turn our attention to the region of Pramanta. With it's mountain defenses and strategic location, it would be a lynch pin in our defensive line in Greece. 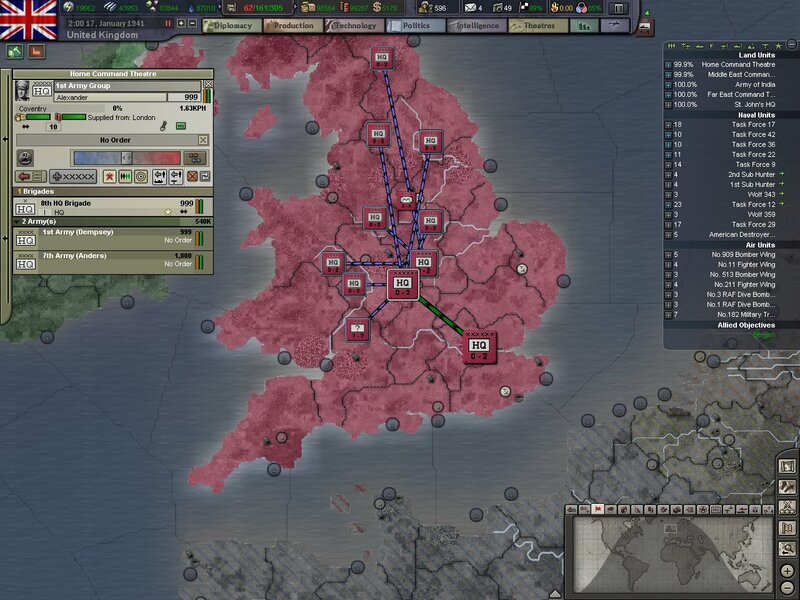 Taking it means we will have to assault from several directions, and have our naval and air force on hand for support. Hopefully once our troops have taken the region; it proves just as hard for the Italians to take as it will be for us. 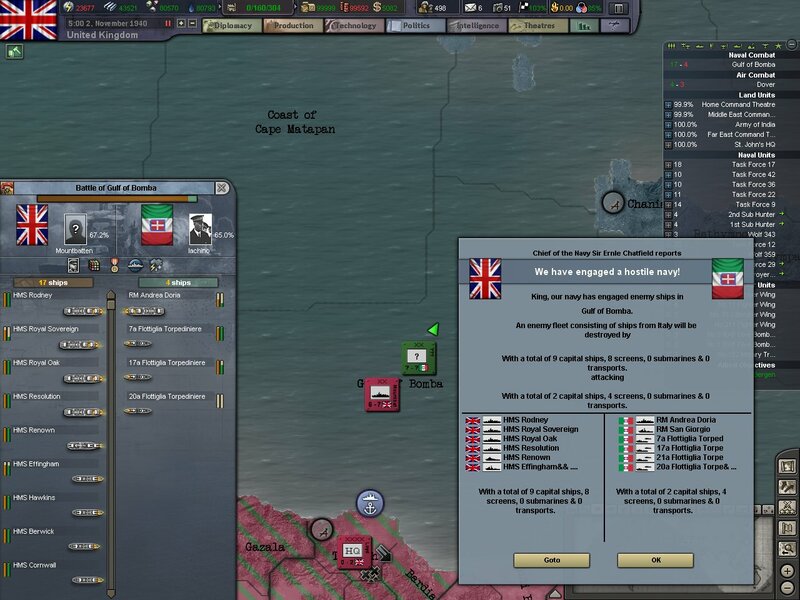 The Italians made another assault onto Malta. 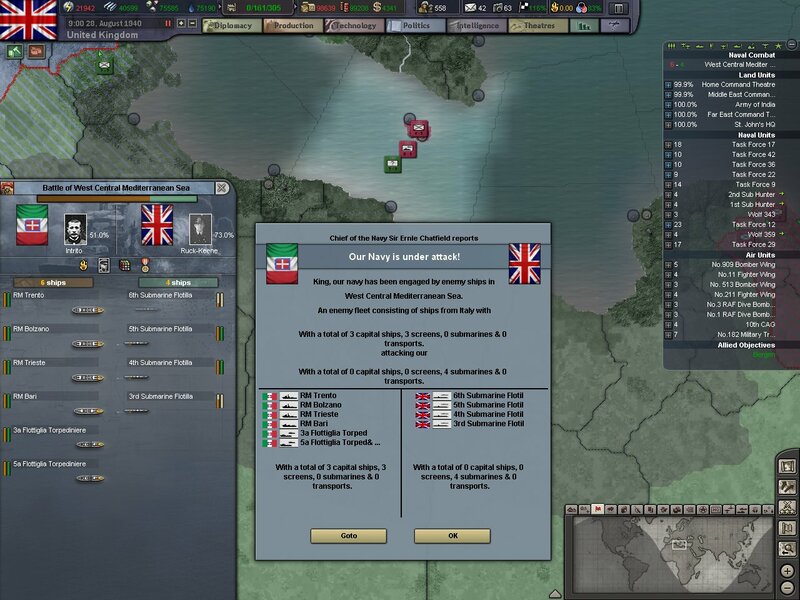 The frequent Italian assaults are so unorganized and disastrous that the Royal Navy doesn't even respond to the site of enemy ships off the island. The Battle of Pramanta has come and gone with our soldiers coming out victorious. To take the region we made four different assaults on the fortifications. Two assaults came from the front across a river supported by artillery and air support. Then an assault from the west was made which came in behind naval gun fire. Finally the fourth and final assault from the north east was made. The final assault gained high ground behind the Italian positions which was the turning point in the battle. 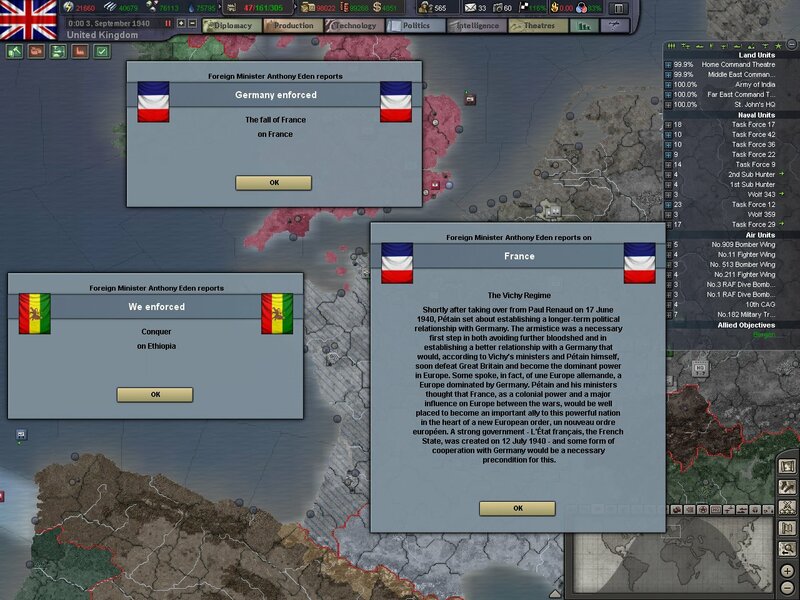 Germany annexed and destroyed another country at the end of March. German troops had invaded Yugoslavia in early march in support of the Italian Balkan campaign. The country of Croatia was formed by Germany as well as land given to Italy. German troops are likely headed for the front in Greece to support their allies. The town of Salonika in eastern Greece had changed hands four or five times by the end of March. Our troops took over defense of the region after a British led assault retook the city from the Greeks. Once again the navy was on hand to lend support. The u-boats had slowly been chipping away at our merchant navy. Bringing down hundreds of tons so far in the war, and an alarming rate of ships were being lost of the coast of Ireland and eastern Scotland. MI5 had been trying to weed out spies in the UK and it was beginning to think that maybe the Nazi information was coming from somewhere outside the Empire. The public eye had even caught onto this as newspapers began reporting on the sinking's off Ireland and the possibility of spies in Ireland. But the sinking of our merchant ships nor the possibility of enemy spies in foreign countries could stop our men from volunteering in droves! Recruitment posts were still flooded and overwhelmed just like in 1939. With this support our men could do anything and go anywhere. 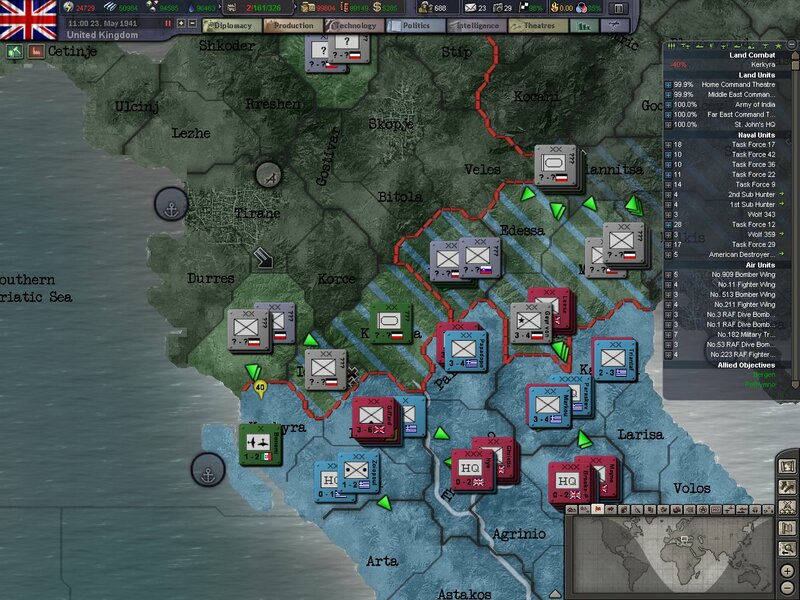 The final week of March saw us make repetitive attempts to take the region of Edesa, but the Italians, and now German units were to well dug in. Our focus now shifted to the defensive with German units now arriving on the front. 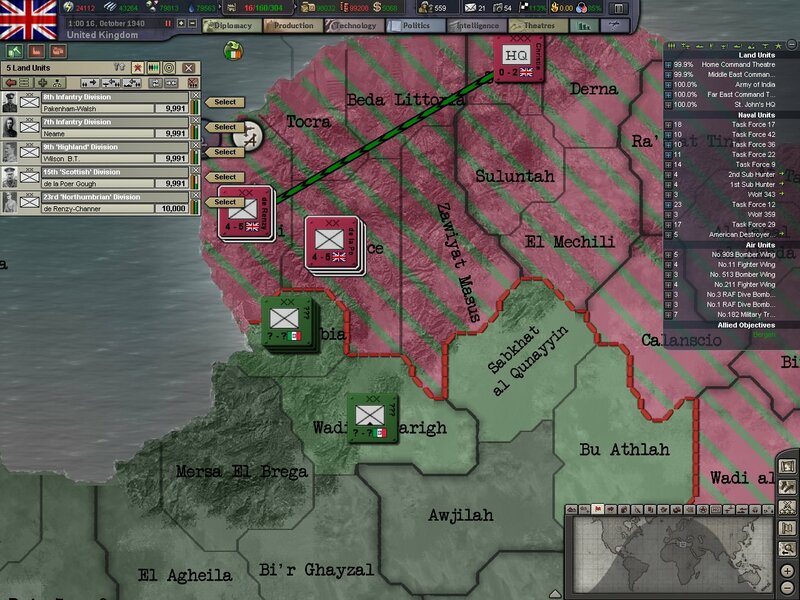 A small Italian offensive in Libya reclaimed some land after one of our divisions that became over extended retired back. The Italians caught the 7th Division dangerously exposed in front of our main line. But a timely withdrawal ended the battle before to many were lost. German troops led an assault to the north of Salonika hoping to cut the city off from our main line. The two day battle would see many more enemy divisions join the fight and our counterattacks wouldn't dislodge the Axis advance. 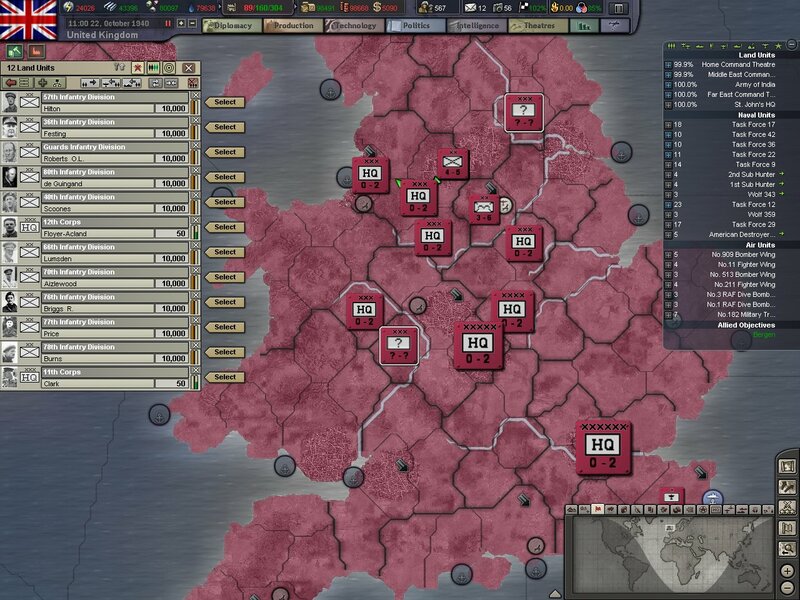 We lost a staggering 1,130 to only 295 Axis dead. Clearly we needed to change the way we were defending our lines as something went horribly wrong. The next German attack came on the northern point of our line. 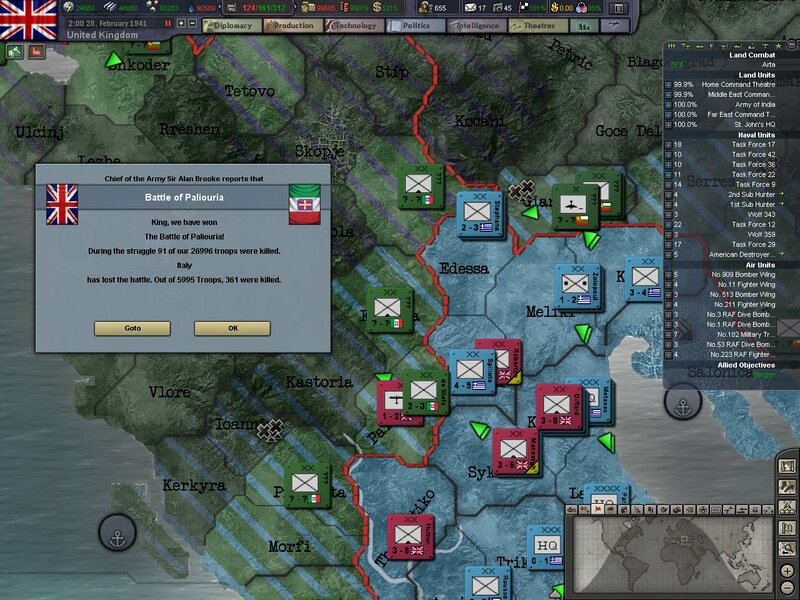 Two Italian mountain divisions, one German infantry division, and two Bulgarian divisions hit Florina which was helped by a Greek division and one of our Gurkha divisions. We had spotted the advance coming and indirect fire from our artillery batteries as well as air support were quickly called in and the advance was painfully slow for our enemies. 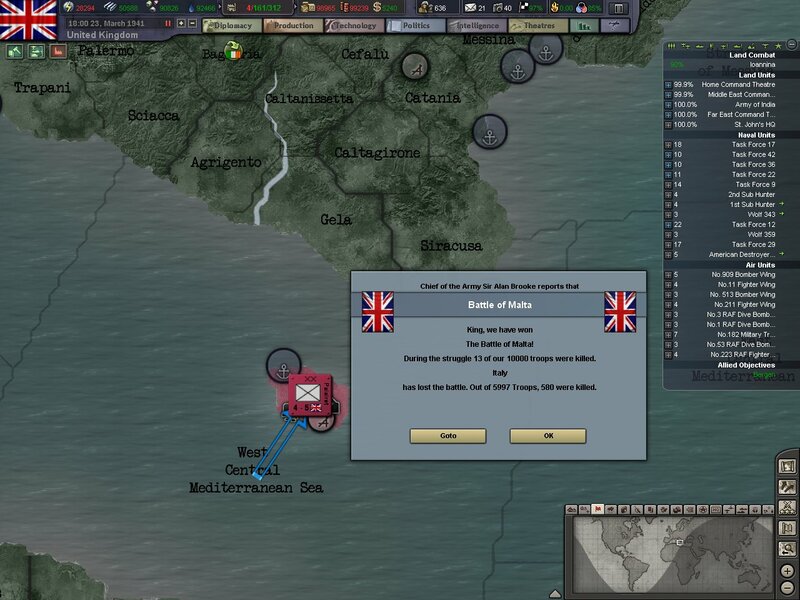 The Gurkha's had been waiting for the Axis forces to attack them for weeks now and had prepared well. The Gurkha's prepared hidden machine gun nests and positions dug into the sides of the mountains where they could fire down onto the enemy below. The combined Axis forces then tried their luck along the coastline as four enemy divisions came rolling down onto the lone 9th Highlanders. Mountbatten was quickly sent to help the situation but the speed of the enemy attack had taken the division by surprise and it was quickly looking like a retreat was in order. An Italian mechanized division also landed on Crete. The island was in effect a floating aircraft carrier, and long range bombers from the island could hit anywhere in the Balkans. Holding the island would be necessary but no troops could be spared for it. Air support and naval help could be given to the Greeks but that fight would be their own. 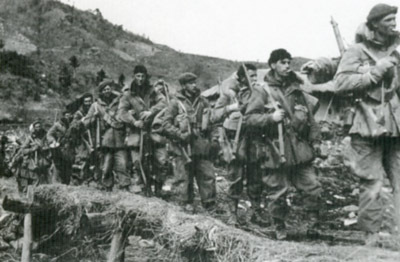 On the 15th the Italians pushed past the 9th Highlanders inflicting 706 casualties whiling losing 167. The 18th Mountain division to the east quickly launched a counter attack on the advancing enemy from the east but that attack had more hope to delay the enemy than retake the lost land. 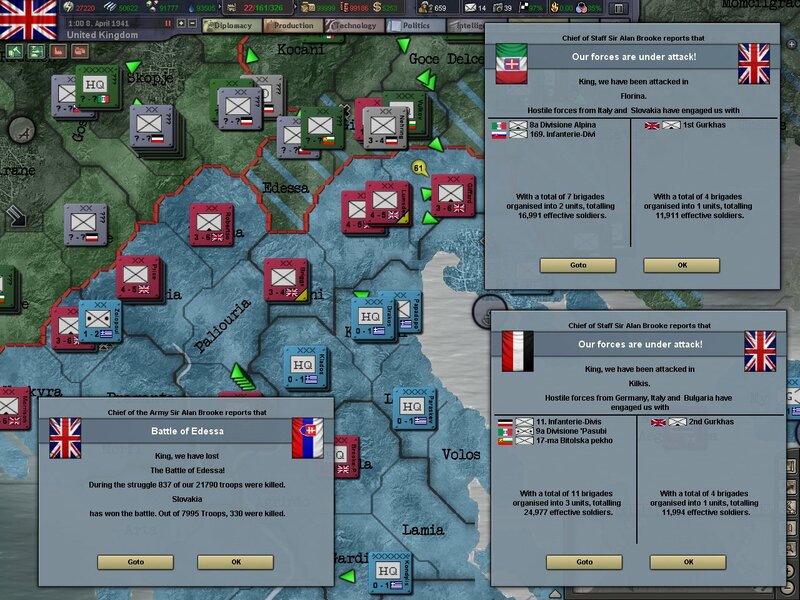 The Axis forces launched their next attacks in the east. The Germans used the region of Edesa to launch attacks on the flanks of two regions of our lines. The result allowed the Axis forces to attack positions in the center of our lines from three directions. As the enemy attacks and advances became more frequent, our troops found themselves not holding positions for very long like they had before April. 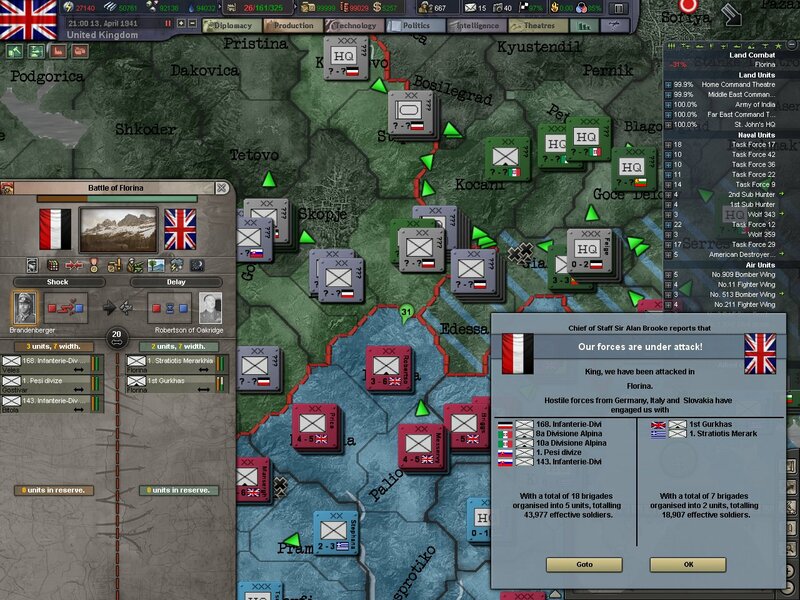 The offensive led by German units was proving more than we could handle. A new plan would have to be drawn up soon and a new line found where we could properly defend it. 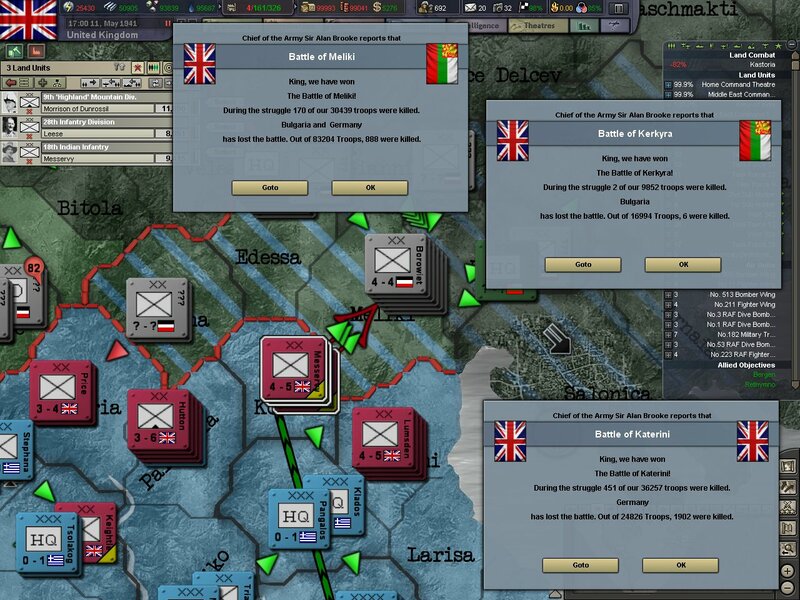 Florina finally fell to Axis forces April 18th after bloody fighting. A new line would have to be formed with the fresh units that were being held in reserve. 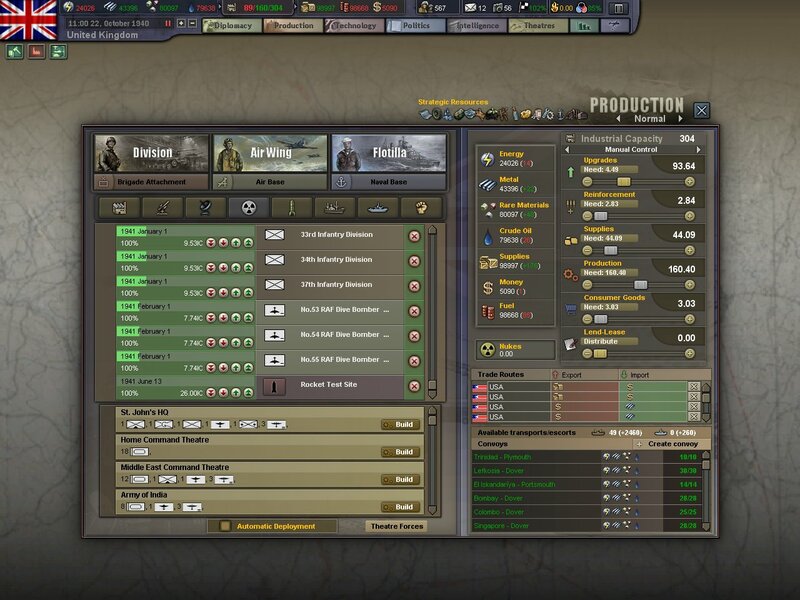 Hopefully our few fresh divisions could hold long enough to reorganize the battered ones. Carrier based aircraft launched repeated air raids on the Italians on Crete all throughout late April hoping to dislodge the mechanized division. A German and Bulgarian attack on Konzai was repelled with enormous losses to the attacking enemy. The death toll was the highest so far seen in the war and was a testament to the bloody and close fighting in Greece. When the death toll reached London the news shocked the public. The scale of death had not been seen since the First World War and pictures from the front of piles of bodies in the mountains brought the fighting right into peoples homes on. 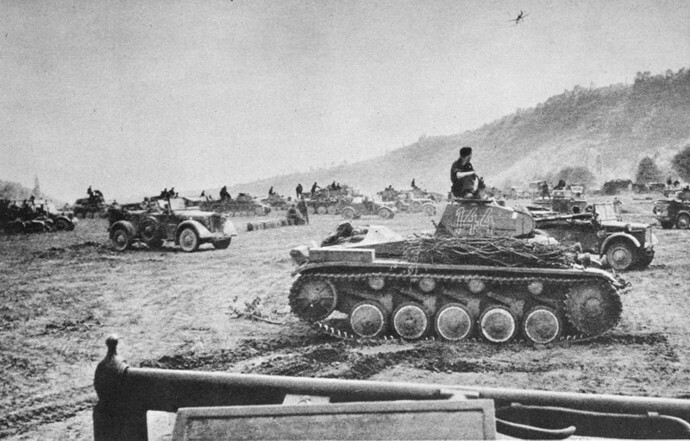 German armored units commanded by Croatian officers launched an attack on the fortifications in Ioannina. The mountain defenses were a nightmare for the tankers. Our troops were able to get behind and above the enemy tanks and our AT weapons ripped right through the vulnerable and weak armor. The 33rd Infantry Division launched an attack on the side of the German armor hoping to retake the lost territory. Progress was going good since most of the enemy armor was attacking Ioannina. 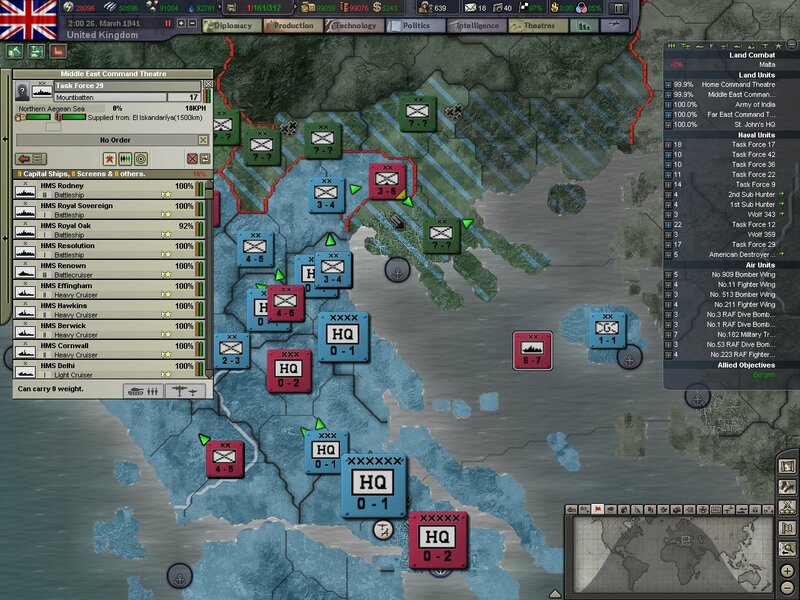 Italian forces had been assaulting Katerini for the past few days and made good progress in that time. That assault was then joined with one on the neighboring province of Kozani. German mechanized units reached the front and the light armor supported by infantry were making life tough for the defending infantry. A two pronged assault retook Floina with low casualties on our side. In retaking this province we reestablished some of the old line and the victory also helped moral which had been flagging. 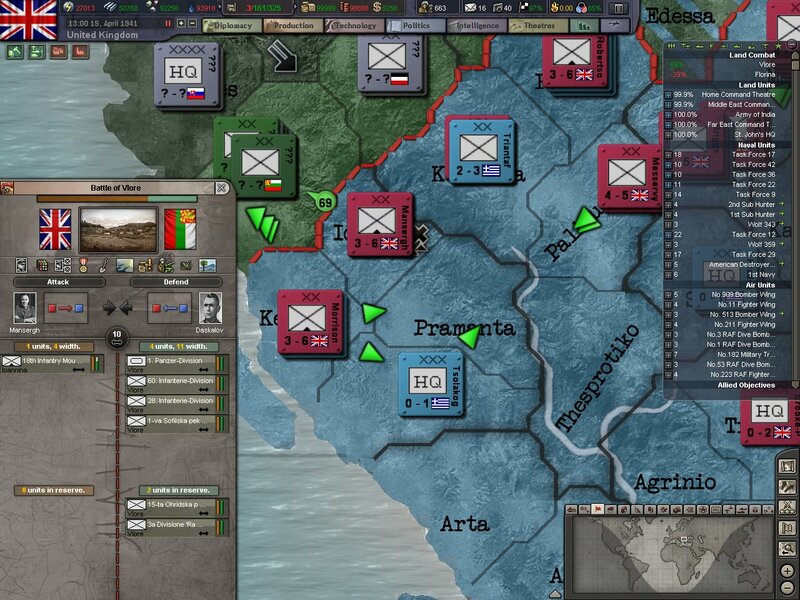 While we retook Florina, the line at Katerini was finally broken by the Italians and Bulgarians. 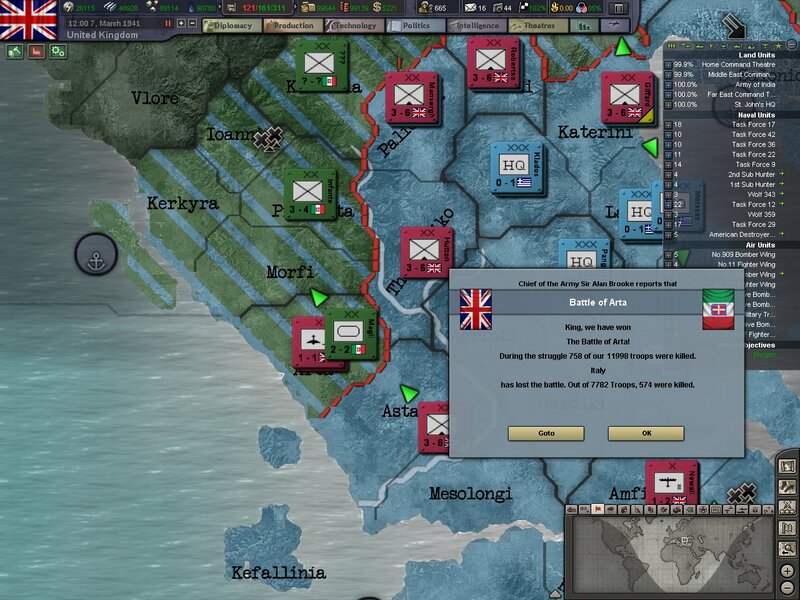 In the defense we lost 419 while killing 533 Axis soldiers. The defeat made the entire line vulnerable was it opened up the coastal road to Athens. 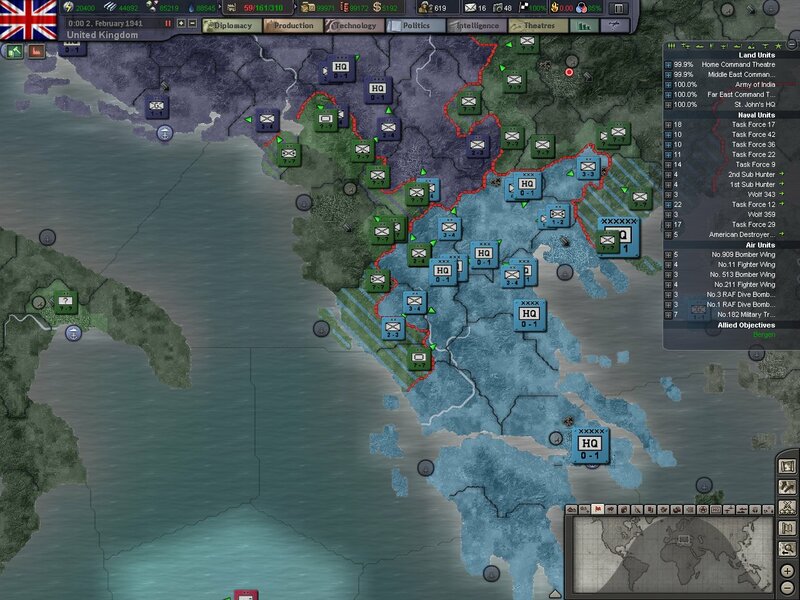 Axis forces could now swing in behind our whole line and cut them off from the ports in southern Greece. 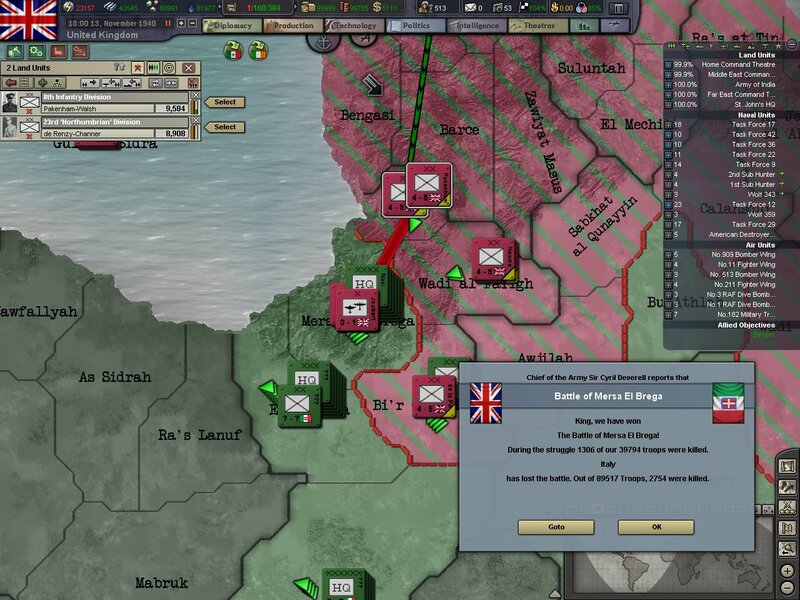 Evacuation and defeat was now slowly becoming an option as the Axis forces grinded our line down. April 28th would be a very good day for our Empire in Greece. 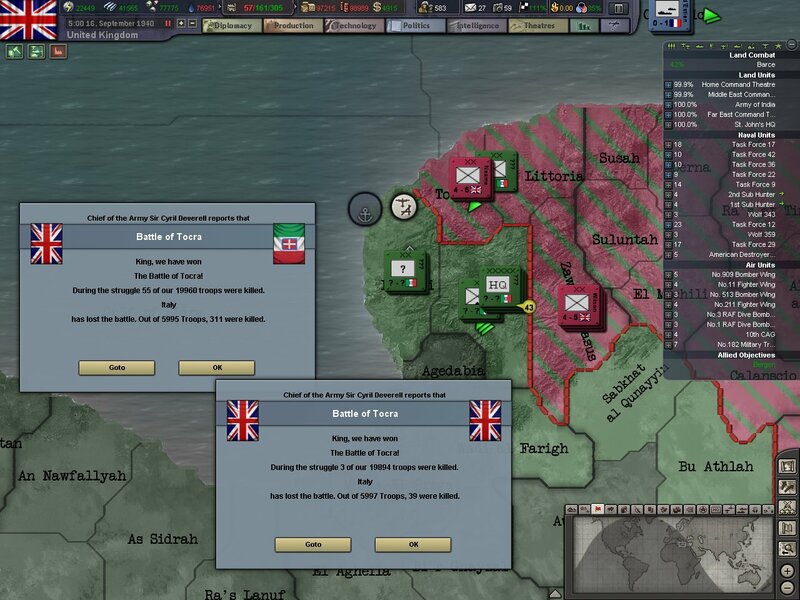 Three battles all ended on the same day, all in stunning victories. The combined Axis forces suffered almost 4,000 casualties in the three battles. Allied command in the region hoped that these stunning victories would help shift the momentum of the campaign back to our side and stop the enemy advance. Two victories ended off April for us. An Axis assault on the fortifications of Ioannia ended in defeat. 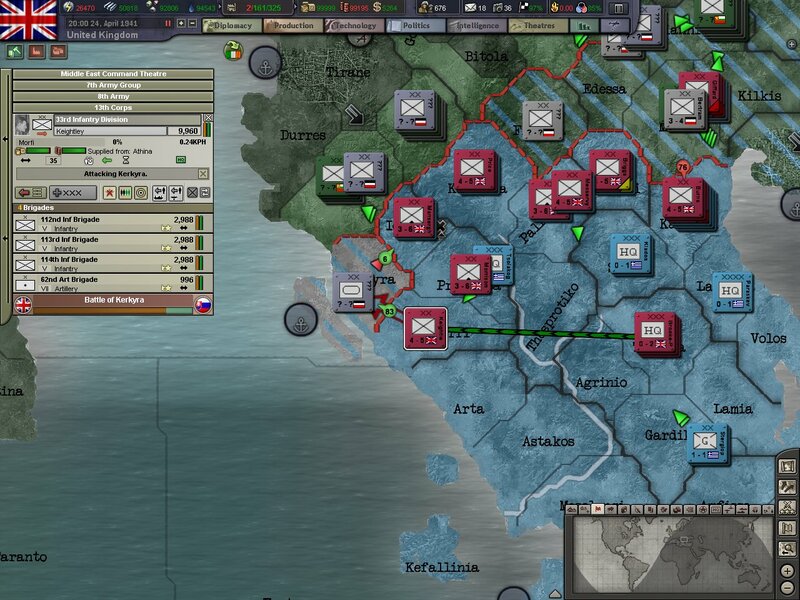 And an enemy attack in Kozani started off disastrously and ended disastrously. Our troops well dug into the mountains funneled the enemy into prepared killing grounds and slaughtered them. 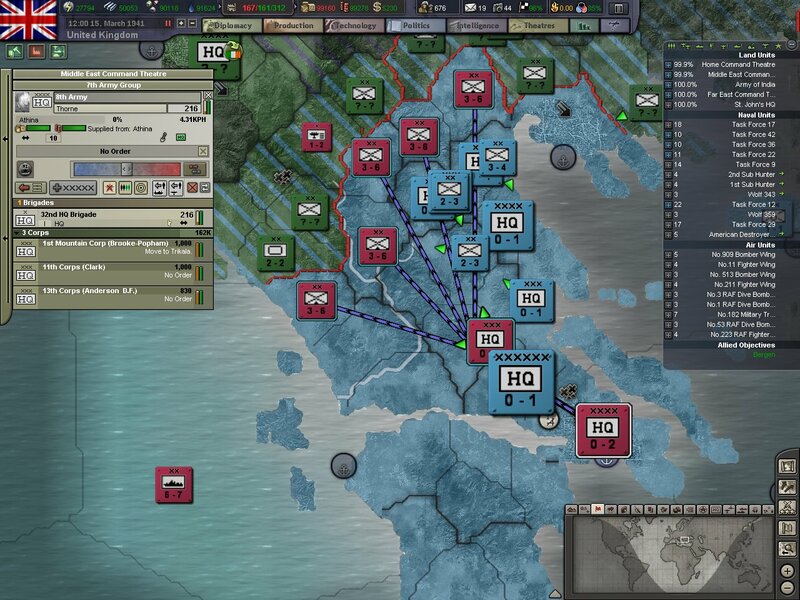 Axis forces once again pushed us out of our coastal provinces and in the center of our line. In the east the Germans had finally brought in their own mountain troops as well as the 11. Panzer Division with heavier armor than we had faced before in the war. We also faced tanks in the center where the skill of German infantry was on full display. In past battles we had been able to get behind tanks to stop them. Here in Kastoria the German infantry supported their tanks properly and stopped our infantry from getting to the weak side armor. 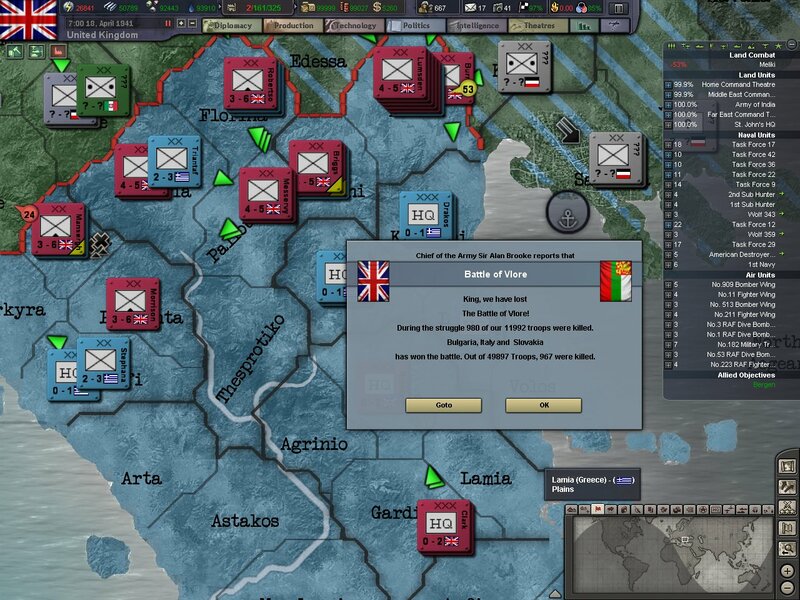 An Italian assault that started off with just a small skirmish slowly ballooned until the enemy was repulsed suffering some 1,300 dead and wounded. We hoped this meant that our line here had finally become solid and the enemy couldn't break through. 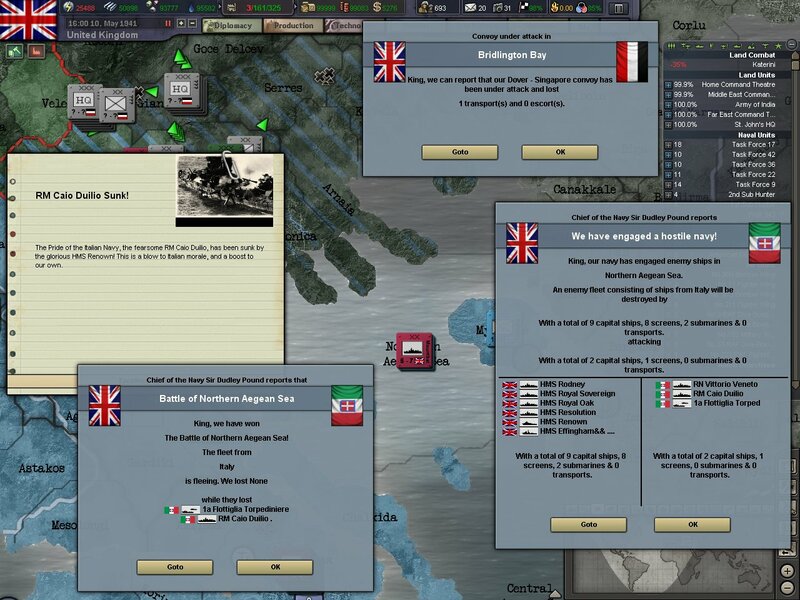 The Italian navy attempted to break our naval supremacy in the waters around Greece but met with only disaster again. This time the Italians threw two of their most modern battleships but the small Italian fleet was simply overwhelmed by the gunfire from our capital ships and was sunk. 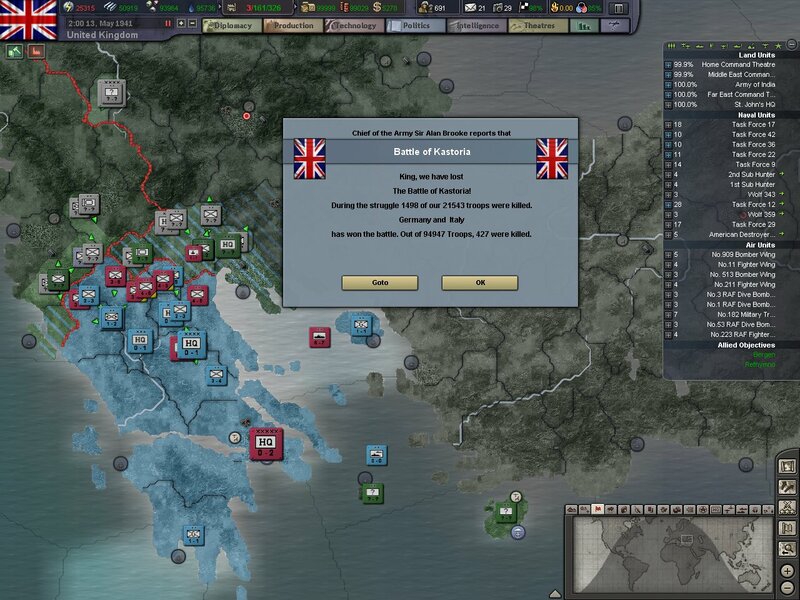 Once again the Germans and their allies were trying to force open the coastal around in Katerini. Our troops managed to hold back the enemy forces with quick counterattacks and attacks on the flanks of the attacking Germans. Another terrible and bloody battle was lost in Kastoria. 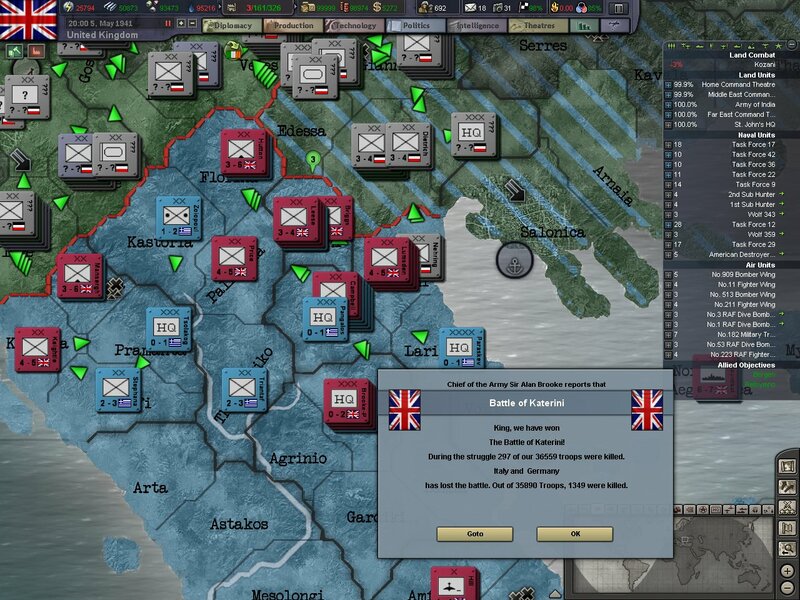 Our forces suffered heavily trying to halt the Axis advance and hold the region. It was to no avail though the Axis forces once again rolled through our lines killing over one thousand men. As our army was slowly being squeezed back in towards itself in Greece we stopped the German advance from being to much of a rout in Paliouria. A counter attack was also launched to retake Florina from the enemy but the attack would only give us hundreds of dead and more wounded. The few ports in southern Greece were by now, overflowing with the wounded from the front. The site was not very welcoming to the fresh recruits arriving from England. 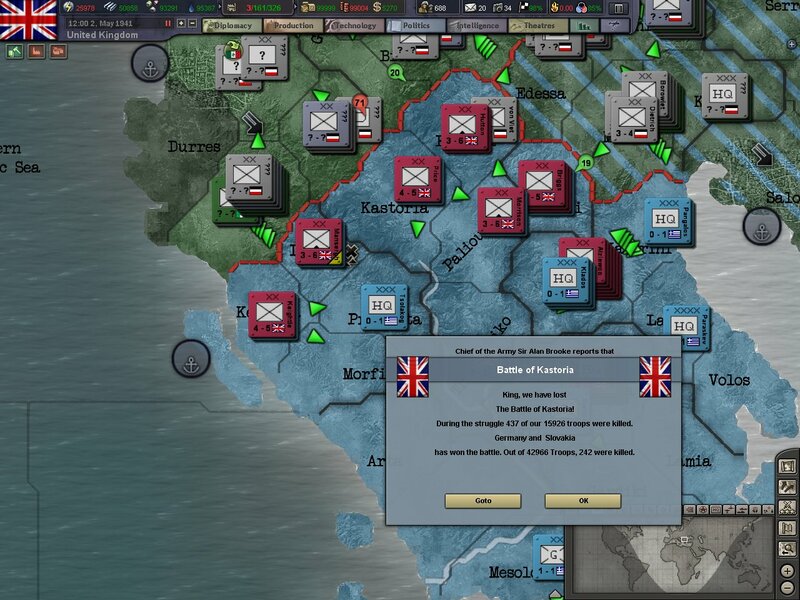 The middle of May saw fighting on the whole front in Greece. Katerini saw almost 5,000 men fall from both sides. 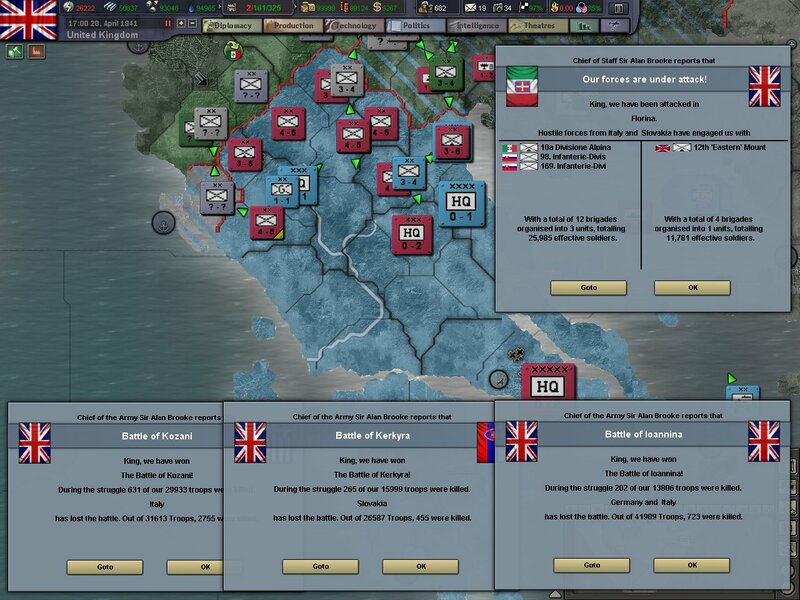 The brutal fighting just showed how much both sides would pay to hold and take ground in this war. In Kozani we pulled our men out before they suffered too many casualties. And in Melilki we were pushed out by a determined and skilled German attack. Well. 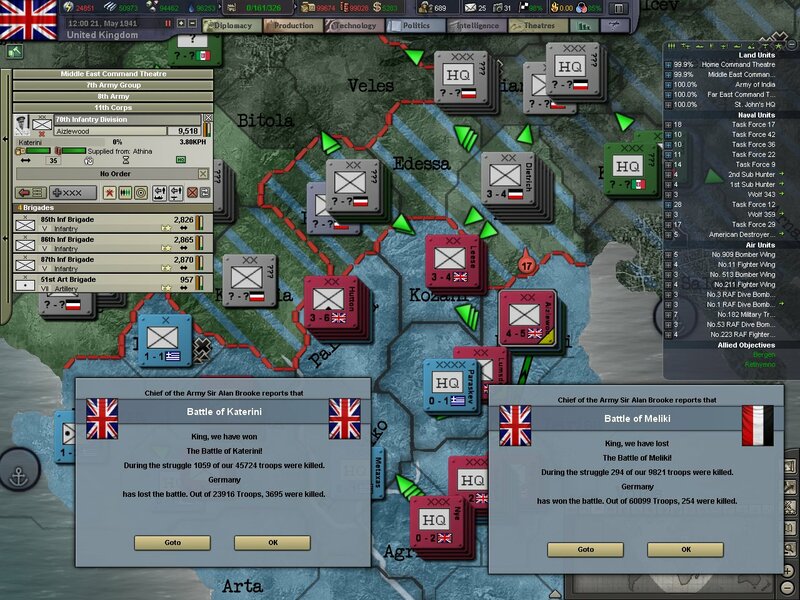 In two months since the Germans conquered Yugoslavia the German led Axis has pushed us back with heavy casualties. And the front is far from stable. Evacuation has been brought up several times at the War Office but the King would not have it. He ordered that evacuation will only be ordered when it is absolutely necessary to save the Empire Forces in Greece. And with May coming to a close. That's where the Empire, and the World sits. With heavy and brutal fighting in Greece. 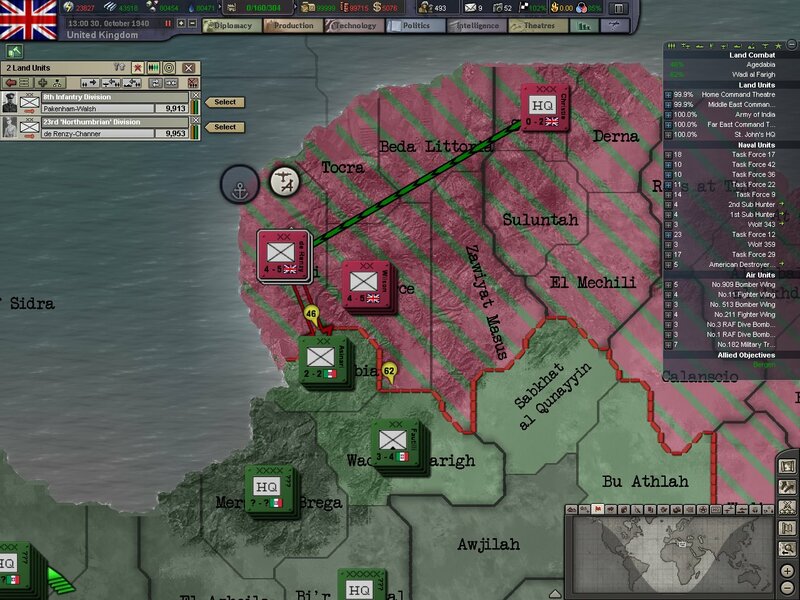 A stalemate in Libya that sees our small Africa Corp,hoping for reinforcements, outnumbered by a strong Italian front line. Our merchant ships falling in suspiciously increasing numbers in the waters of Ireland and German bombers beginning to hit British soil. 1941 has proved to be a bloody year and it can only get bloody as the year continues.